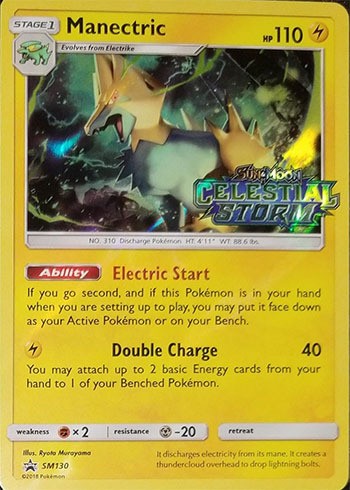 Like the previous two August sets (Steam Siege and Burning Shadows), this year’s August set, Celestial Storm, will be legal for the World Championship, creating a brand new meta game for the ultimate tournament of the year. Celestial Storm brings with it 11 Pokemon GX, 3 Prism Star cards, and 3 Ultra Beasts. Like the past few set reviews, I won’t give out a rating for pre-evolution Pokemon that don’t fulfill a role outside of being a pre-evolution, but I will take a moment to discuss any pre-evolution Pokemon that has something interesting going on with them. One final note before getting into the review. For cards I couldn’t find a picture or scan of, I’ve used the translated version of the Limitless TCG proxy for the card, so attack names, Ability names, and some text may be different on the actual final card. Victreebel may catch some players’ eyes for its Fragrance Trap Ability, which is essentially Pokemon Catcher in Ability form. The history of this Ability on Stage 2 Pokemon is poor, and with the investment it takes to get a Stage 2 into play, it would be better off to just play multiple copies of Pokemon Catcher. 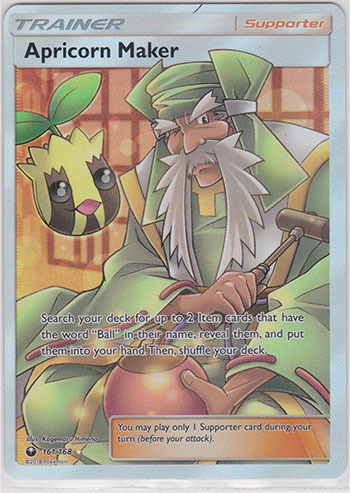 The only situation where this card becomes relevant is if there is a Victreebel deck based around another Victreebel, and given the quality of the other Victreebel cards in format, I wouldn’t hold out for hope for this becoming a thing. I think it’s only a matter of time before Pokemon realizes that this Ability is not viable on a Stage 2 Pokemon and finally acquiesces and puts it onto a Stage 1 Pokemon. 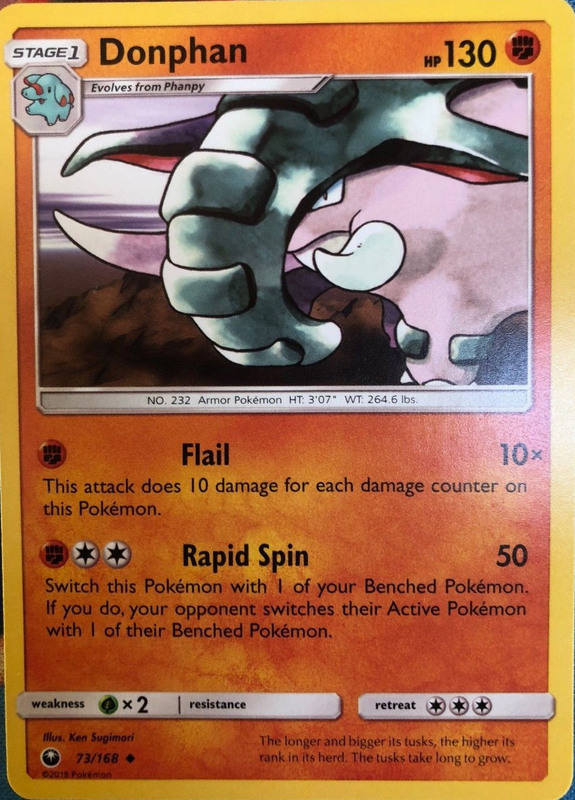 Scizor GX will be covered later in this article, and it looks at the very least decent, but I wanted to take a moment to highlights its pre-evolution, Scyther. Pokemon gave Scizor fans a good pre-evolution for any prospective Scizor or Scizor GX deck. 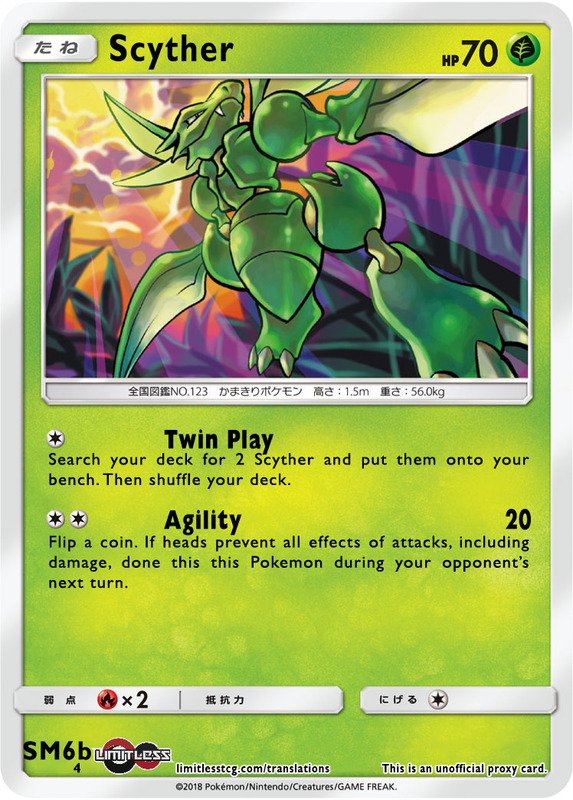 Twin Play makes Scizor decks more consistent, as setting up their board is built into Scyther’s attack, and then Agility could be used to stall out the opponent in the early game to buy turns to get further setup. This is the best Scyther available to players in both the Standard and Expanded formats. 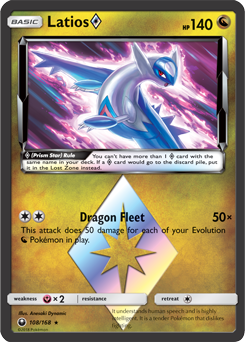 Ariados’ Reactive Poison is a functional reprint of the Hex Flame attack on Ninetales from Dragons Exalted. Ninetales never became a top tier meta card or anything, but it did see some tournament success while legal. I actually covered Ninetales in an Expanded Exploration during this past season, so make sure to check out that article if you want to see what a functional Ninetales deck looks like. Reactive Poison has the potential to hit for a ton of damage if you can figure out a way to load up the opposing Pokemon with various Special Conditions. In total, there are five Special Conditions in the Pokemon TCG – Asleep, Burned, Confused, Paralyzed, and Poisoned. A Pokemon can only be one of Asleep, Confused, or Paralyzed at any single moment, so the maximum Special Conditions you could inflict upon an opposing Pokemon is three, for a maximum of 170 damage…or 200 with a Choice Band. However, the damage situation is actually a bit better than that, as you get some amount of guaranteed damage output from Poison (10 damage in between turns) and Burn (20 damage between turns, flip to see if it goes away), so your actual effective maximum damage output is really 200 base damage. To make an effective deck around Ariados, you will want to partner it with Abilities, Supporter, and Item cards that can inflict Special Conditions upon the opposing Pokemon. Using an attack, like Ariados’ own Spider Trap, can work in some situations, but to make this strategy work successfully across various matchups for the length of a game, you can’t be taking two attacks to get these knockouts setup. Inflicting Special Conditions through attacks gives your opponent a turn to get out of those Special Conditions. As far as Abilities go, in Standard we have Nihilego GX’s Empty Light Ability, which does Confusion and Poison to both active Pokemon when you play Nihilego GX from your hand to your bench. To use this, you would need to retreat into your Ariados after using the Empty Light or have some other way to gain immunity. Salazzle GRI’s Hot Poison Ability leaves the opposing Pokemon Burned and Poisoned when you play Salazzle from your hand to evolve Salandit. Delphox from Forbidden Light burns the opponent’s Active Pokemon with its Mystical Torch Ability, which can be used once per turn. Hypno from BREAKpoint’s Goodnight, Babies Ability puts both Active Pokemon to sleep (and you can wake up your own with All Night Party). Raichu, from Burning Shadows and Shock Lock fame, paralyzes the opponent’s Active Pokemon with Evoshock when you play Raichu from your hand to evolve Pikachu. In Expanded there are more options, such as Ariados AOR for Poison every turn and Munna BCR for Sleep from a basic Pokemon. We also have Hypnotoxic Laser, which can give you Poison and potentially Sleep from an Item card. In addition to these cards, we also have Pokemon like Infernape from Ultra Prism/Forbidden Light, whose Flaming Fighter Ability boosts Burn damage to 60 instead of 20, and Seviper, whose More Poison Ability makes Poison damage 10 more for each Seviper you have in play. The most practical way to build this in Standard right now is probably going to be to go for only two Special Conditions with Salazzle GRI. With that, you are hitting for an effective 150 damage after Poison/Burn, which can be boosted up to 180 damage with a Choice Band. From there, I would supplement the damage output with Shrine of Punishments (covered a bit later in this review) and maybe a copy of Seviper. I would also probably include at least 1 copy of Nihilego GX for an alternate means to hit Special Conditions and a way to get up to three Special Conditions for OHKO’s. 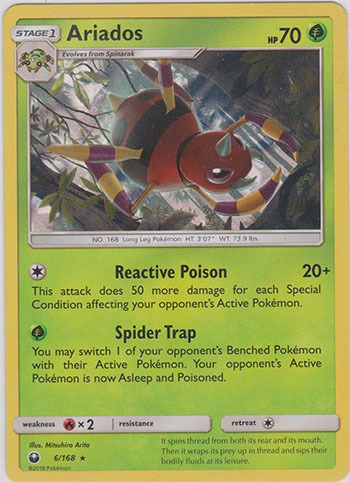 Beyond Reactive Poison, Spider Trap is a nice attack that can setup knockouts with Ariados, or at the very least something that has the potential to stall some turns for you if you’ve worn down your opponent’s switching resources. It should be noted, that you may not always have this option available to you, as you may not always be playing Grass Energy with Ariados. I actually really like that Reactive Poison is Colorless, as it gives players the opportunity to add various techs into the deck to deal with specific matchups. For example, if Rayquaza GX is big, you could play Tapu Lele from Ultra Prism to counter it. There is also a combo with Po Town, Hustle Belt, and Rainbow Energy, which would give you 80 base damage, which is 180 with two Special Conditions and effectively 210 damage if it is Poison/Burn conditions inflicting the opposing Pokemon. These decks can sometimes be too convoluted to be consistent enough for competitive play, so there is reason for concern there, but with Salazzle, Nihilego GX, and the ability to tech or strengthen the deck thanks to Ariados’ Colorless attack cost, I think Ariados does come with a bit more potential than Ninetales had. Sceptile allows Grass Energy decks a great matchup against Ultra Beast Pokemon with its Nature Power Ability, which prevents damage from Ultra Beasts against your Pokemon with Grass Energy attached to them. I don’t think it is likely that a meta develops in which it makes sense to play this card solely to counter Ultra Beast cards, there are too many good Pokemon outside the realm of Ultra Beasts that it’s too hard to think about a meta coming about in which they dominate to the point of it making sense to play Sceptile. 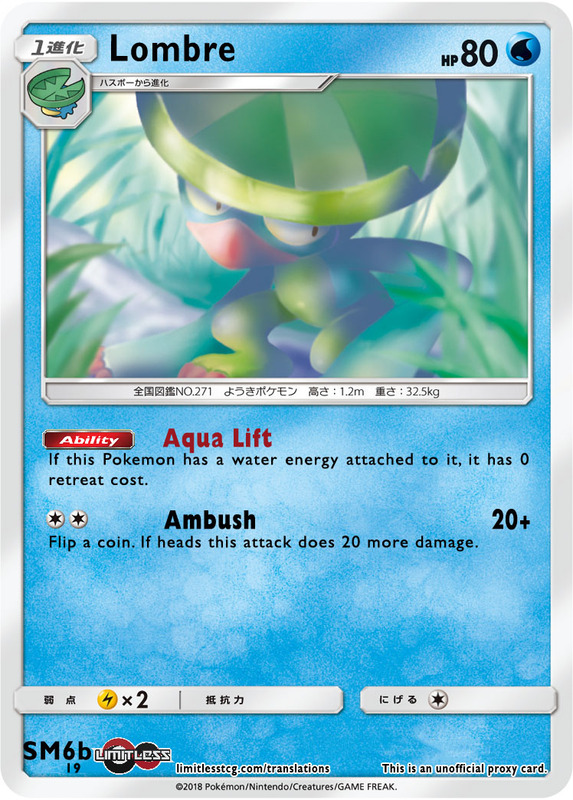 Nuzleaf is a good Stage 1 for Shiftry decks to have at their disposal. Its Clear Out attack has your opponent reveal their hand and then you choose a Supporter card you find there and have your opponent shuffle it into their deck. If you were to shuffle in your opponent’s only draw out with Clear Out, you could potentially disrupt their ability to setup their board to the point you essentially won the game off that one attack. Definitely a nice consolation prize for when you can’t get Shiftry GX into play on the second turn of the game. Shiftry GX has very solid OHKO potential with its Extrasensory attack, which does 90 damage, plus 90 more damage if you have the same amount of cards in your hand as your opponent. Not always the easiest thing to do, but cards like Copycat, Judge, or just growing your hand with Zoroark GX and playing down to the same number of cards are all ways to accomplish this goal. Extrasensory can hit for 210 damage with a Choice Band, which will OHKO most of the commonly played cards. At 240 HP, if you’re taking OHKO’s with Shiftry GX, you are going to be winning that prize trade most of the time as a lot of Pokemon won’t be able to OHKO Shiftry GX back. One thing that alarms me with Shiftry GX is its [G][C][C] attack cost. I remember Shiftry FLF having a similar attack cost, and that always was enough of a hindrance towards building a consistent deck around it. 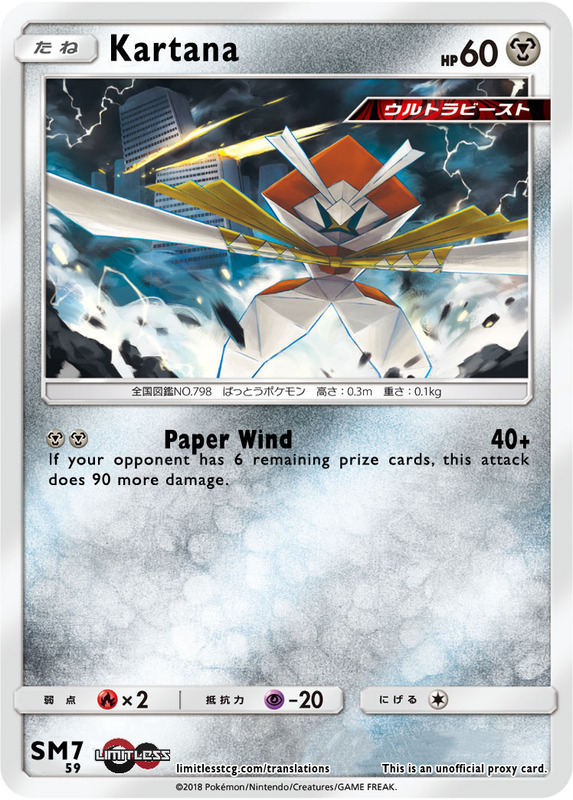 I would look to Vikavolt SUM or Abomasnow FLI as the main Grass accelerators to make a deck around Shiftry GX work. A dual Stage 2 deck if you go the Vikavolt route isn’t super appealing, but since you would be playing Grass Energy, you might be able to build something with Leafeon GX to aide in your field getting setup. Even if you’re forced to manually setup your Shiftry GX, that’s not the worst thing in the world. Perplex does 40 damage and Confuses the opposing Pokemon. That helps setup knockout math for Extrasensory while also forcing your opponent to have to find a switching card or forces them to try to flip through Confusion. 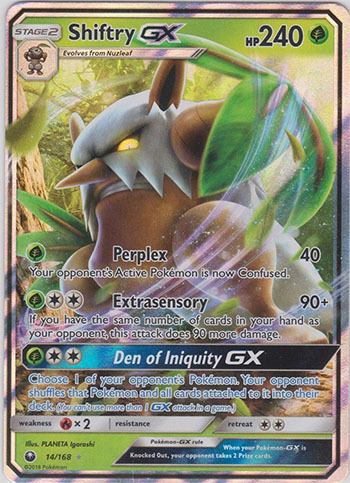 Den of Inquity GX isn’t something you would use too often, but board states do develop where your opponent has one big attacker that they can’t easily power back up, and just removing it from play does enough to put you in the winning position. Volbeat and Illumise must be discussed together as their entire existence depends upon each other. 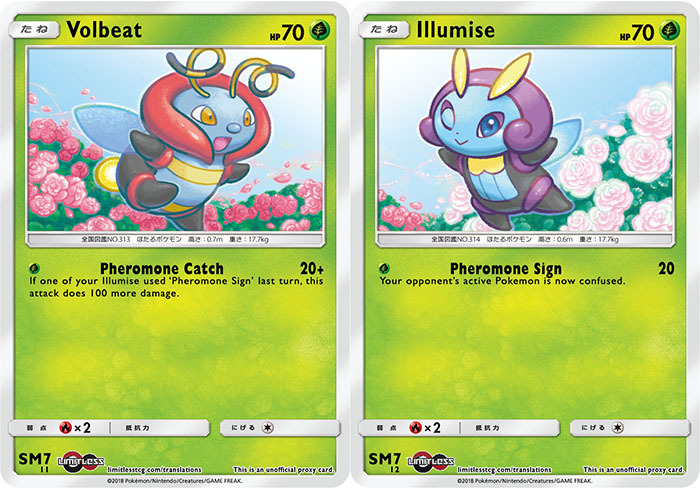 The way the deck works is you use Illumise’s Pheromone Sign for your first attack, doing 20 damage and Confusing the opposing Active Pokemon. Then on the next turn, you use Volbeat’s Pheromone Catcher attack, which does 20 damage, plus 100 more damage if you used Pheromone Sign with any Illumise the previous turn. You then alternate back and forth between these attacks. The total of the two attacks is 140 damage for each combo, which can be boosted to 150 + 50 with Choice Band for 200 total damage across the two turns. Shrine of Punishments can help you out even more with damage numbers. While I think this strategy may work out okay enough against any GX heavy deck, the deck would fall apart against any deck that could stream non-GX attackers that do 70 damage back to back turns, as the Volbeat/Illumise deck would only be able to take a knockout against them once every two turns. Cacnea now becomes the best legal Cacnea card to evolve into Cacturne from. 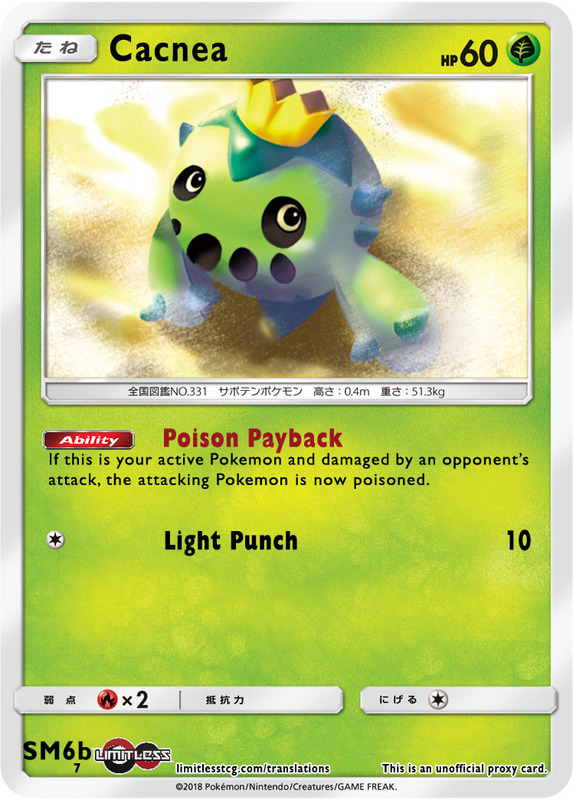 Its Ability poisoning the opposing Pokemon when attacked for damage gives you a nice attribute for your pre-evolution that none of the other Cacnea cards have. 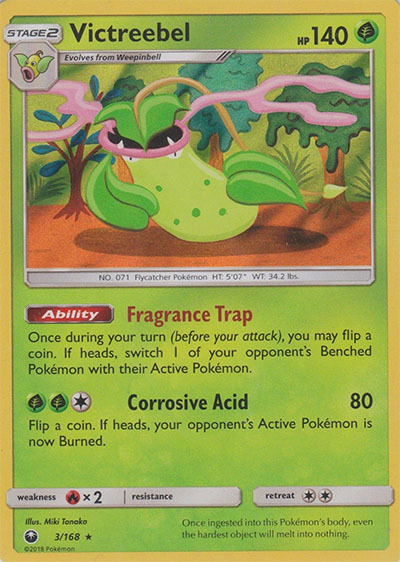 None of the current Cacturne cards, including the one in this set are competitively viable. Magcargo provides us with a strong consistency card with its Smooth Over Ability, which lets you search your deck for a card, shuffle the rest of your deck, and then put that card on top of the deck. 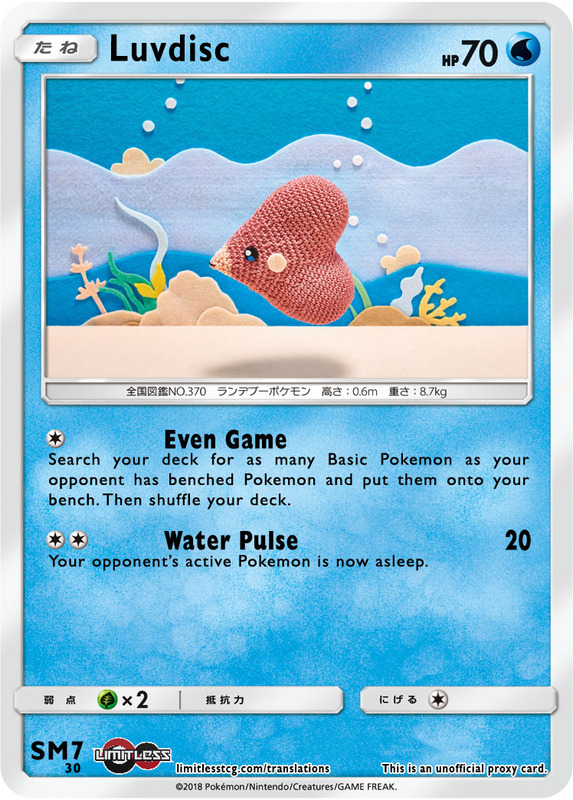 The most common way players will look to play it upon release is to combo it with Pokemon or Item cards that can draw cards beyond your Supporter for turn. Zoroark GX, Octillery BKT, and Acro Bike are the cards that will probably be most commonly paired with Magcargo. Even if you aren’t playing supplemental draw, I still think Magcargo is a very strong card. Being able to control your top deck for the next turn is very strong. For example, if you need a Guzma on your next turn to win the game, you can use Smooth Over to search out that game winning Guzma. It can also be good when paired within a turn with a draw Supporter, such as Professor Sycamore. 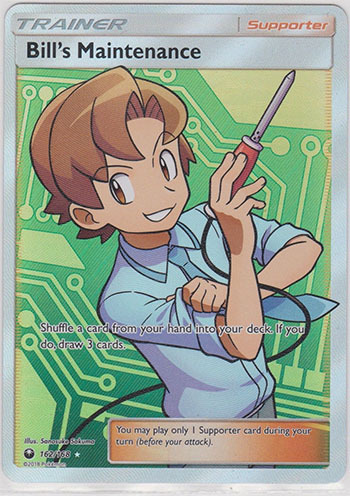 If you need a Field Blower to remove a Fighting Fury Belt to take a knockout the next turn, you can put it on top of your deck, play your Professor Sycamore, and guarantee that you hit it. Beyond the cases of searching out a card to get in your hand, it can also be used to make uncertain cards certain. The two big ones would be the Energy accelerating cards Max Elixir, which is Standard legal, and Ether, an old Expanded card from Plasma Storm, which has you reveal the top card of your deck, and if it’s a basic Energy card you can attach it to 1 of your Pokemon. With the MagEther engine, for the first time ever, you can guarantee that your Ether is successful 100% of the time. In the past, cards like Lunatone PLS or Pokedex could be used to re-order the top few cards of your deck, but if you didn’t have Energy in those cards, than you were out of luck. With the MagEther engine, all types in Expanded will now have a method of Item based Energy acceleration. I think Magcargo will see lots of play, especially post rotation, and will pop up in a number of creative ways. Magcargo allows players to play the game with more precision, and when players are allowed to play with more precision there is generally going to be more opportunity for the more skilled player to find the right plays to win against their opponent. 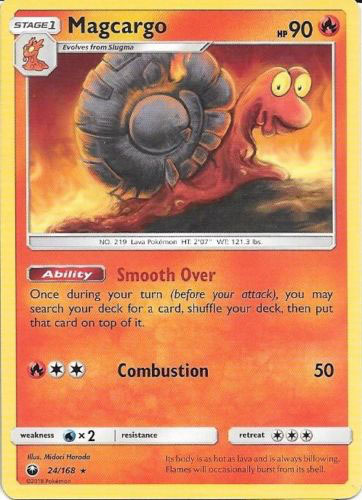 Before I get into reviewing Blaziken GX, I want to preface the review by saying that there is a non-GX Blaziken card that accelerates a Fire Energy from your discard pile to one of your benched Pokemon with its Fire Starter Ability. This card was expected to be in Celestial Storm, but was inexplicably left out of the set. After gathering some more information on these prospective cards, it would seem that it was left out of the set because there is another Torchic and Combusken card that are still due for release, and they decided to hold that off for future release instead of jamming 3 Torchic and 2 Combusken into the same set. This means of course that Blaziken will not be released in time for the World Championship, and with it, Blaziken GX will most likely be irrelevant for the World Championship…granted Mega Audino won Worlds two years ago, so anything is possible. The earliest we might see the non-GX Blaziken is in the Dragon Majesty set, which releases on September 7th, which would at the very least make Blaziken a playable deck during quarter 1 League Cups and Memphis Regional in October. If it’s not in Dragon Masjesty then we will have to wait for the November set for it to come out. 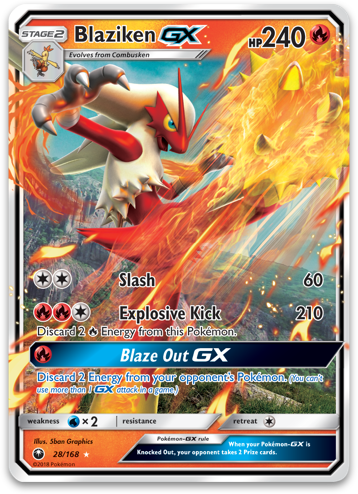 Blaziken GX itself is a powerful attacker, hitting for 210 damage with its Explosive Kick attack. With Choice Band, you get up to 240 damage, which will allow you to OHKO almost everything in the format. It does cost three Energy and you discard two of your Fire Energy with the attack, so you need something to power it up from turn to turn, and that’s where the non-GX Blaziken comes in. It can power up Blaziken GX with its Fire Starter Ability. Now one very awkward factor for Blaziken GX is that it evolves from the same line as Blaziken, and you would need at least two non-GX Blaziken in play at a time, so getting evolved into both Blaziken GX and Blaziken successfully is awkward. However, there is a pretty good way around this, and that’s Ho-Oh GX’s Eternal Flame GX attack, which you can use to put Blaziken GXs from your discard pile onto your bench. If you set it up without the aide of Ho-Oh GX, you have access to its Blaze Out GX attack, which lets you discard two Energy from your opponents Pokemon. 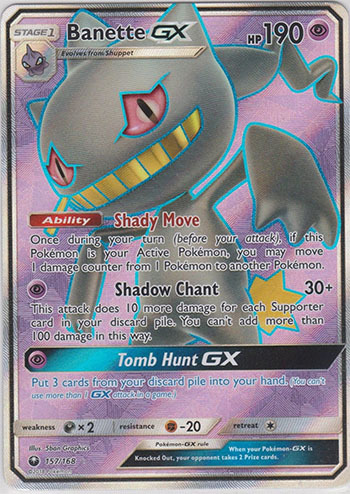 This is the same as Umbreon GX’s Dark Call GX, which when Umbreon GX was played did end up being a nice attribute that it brought to its decks. Blaziken GX definitely deserves a hit for the consistency problems it will present when being played, but if someone figures out the right list to make all of this work, it’s certainly a super strong attacker that will be problematic for almost any deck to deal with. 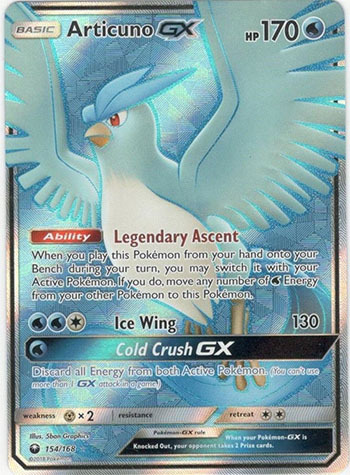 Articuno GX isn’t a spectacular attacker, but it does just enough damage that it may be able to be relevant in Water decks. Most basic or Stage 1 non-GX attackers have around 130 HP or less, so Articuno can come in and take knockouts against these Pokemon. In current Water decks, you often find that Volcanion Prism Star doesn’t do quite enough damage, while Lapras GX is a bit of overkill against some of these smaller Pokemon. Against GX Pokemon, 130 is good enough to take a 2HKO. Its Legendary Ascent Ability makes it easy to play, allowing you to let it swoop in, taking the Energy off a damaged attacker, or cleaning up a messy field of Energy and consolidating it onto itself so it can attack. I think Articuno GX is going to be a natural fit in the Turbo Lapras GX deck. There will even be situations with Lapras GX where you don’t want to actually move any Energy onto Articuno GX, you just want to switch it into the active position to reset Lapras GX’s Blizzard Burn. Cold Crush GX is a solid disruption attack. Since it only costs a single Energy, if you’re doing something like a 1 for 3 Energy exchange, you’re going to be coming out ahead in that exchange. Like with all of these disruption attacks, they’re not going to be good all the time, but you can find game states in which they are absolutely killer. Swampert is an intriguing Stage 2 Pokemon, with a potentially strong attack and a great Ability. Its Power Draw Ability lets you discard a card from your hand and then draw 3 cards. This means, unlike most Stage 2 decks, any prospective Swampert deck is going to be super consistent and get setup without much issue. Where I would be concerned with Swampert is with its attack, which I think probably isn’t strong enough. If you fulfill all three Energy in its attack cost, you’re still only doing 140 damage, or 170 damage with a Choice Band. You have Aqua Patch and The Masked Royal to power it up, but will that be enough Energy to get you by in a game? Probably not, as even with a Choice Band, three Energy only gets you to 170 damage. However, Shrine of Punishment may work well enough for getting you the last bits of damage you need, so it’s really hard to tell. 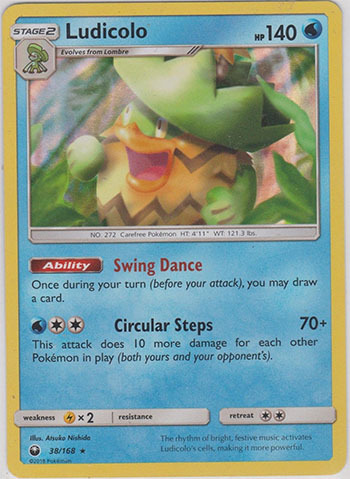 Lombre gives a nice Stage 1 for any Ludicolo deck, giving you free retreat when you have a Water Energy attached, allowing you to be less wasteful with the Energy you attach. Ludicolo is an easy card to overlook, but it may have decent potential. It has a [W][C][C] attack cost, so you can power up its Circular Steps attack with an Aqua Patch and Double Colorless Energy attachment. You do 70 base damage, and then 10 more damage for each Pokemon in play, excluding the active Ludicolo. Based on your own bench, you’re doing 120 damage, but really it’s 130 damage, since your opponent needs to have an active Pokemon. That’s already up to 160 damage with a Choice Band. For each benched Pokemon, that goes up, 170 with 1, 180 with 2, 190 with 3, etc. Ludicolo provides much of what Swampert does, but in an easier to setup package. It even comes with its own draw support in the form of its Swing Dance Ability, which simply lets you draw a card once per turn. It’s not nearly as strong as Zoroark GX’s Trade or Swampert’s Power Draw Ability, but it’s still something, and every little bit of consistency helps. Parallel City, at least during the Worlds format, is a concern for your damage output, but you can use Darkrai GX to re-populate your bench following a Parallel City as a way around that. Wailord comes in with a massive 220 HP for a Stage 1 Pokemon. 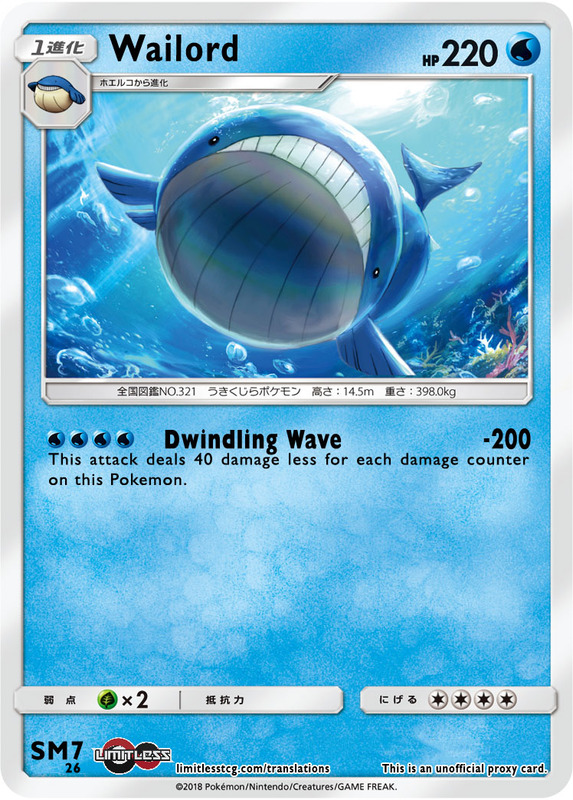 Its Dwindling Wave attack does 200 damage, -40 damage for each damage counter on Wailord. This means that you pretty much will need to be attacking with an undamaged Wailord to get good use out of it. With an Energy cost of 4, this is a tough thing to accomplish, and I don’t think it can be accomplished without the help of an Ability, either to accelerate Energy or an Energy Trans Ability. 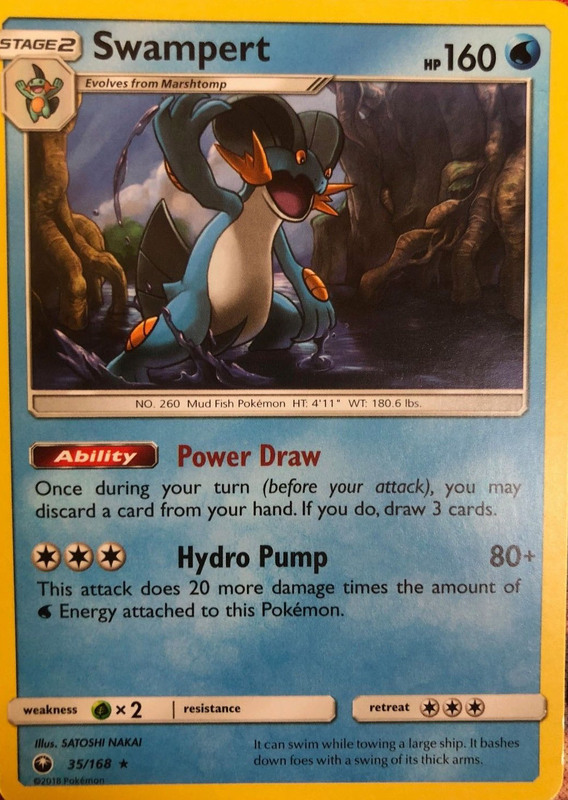 In the current Standard format, that means the best pairing for Wailord is Golduck BREAK. Golduck BREAK lets you move Basic Energy attached to your Pokemon from one to the other as often as you like during your turn. You would be able to move all Energy off Wailord, Max Potion it, and then move the Energy back and attack. Golduck BREAK would be less consistent than traditional Energy Trans decks, even previous Stage 2’s like Klinklang BLW or Hydreigon DRX. A BREAK Pokemon that evolves from a Stage 1 is actually more difficult to get into play than a Stage 2 Pokemon, as the Stage 1-Break Pokemon cannot be evolved into with Rare Candy. Golduck BREAK has never found success, even with Basic Pokemon, and evolving into it, as well as a Stage 1 is an even higher degree of difficult that must be met, so I’m not too optimistic that a consistent list could be made from this. In Expanded, Wailord is also a potential partner for Blastoise in a dual evolution deck. It is definitely worth keeping Wailord in mind moving forward. Something that hits for that much damage with that much HP definitely has high potential, but the drawback of its attack is going to make it difficult to build a good deck around it. 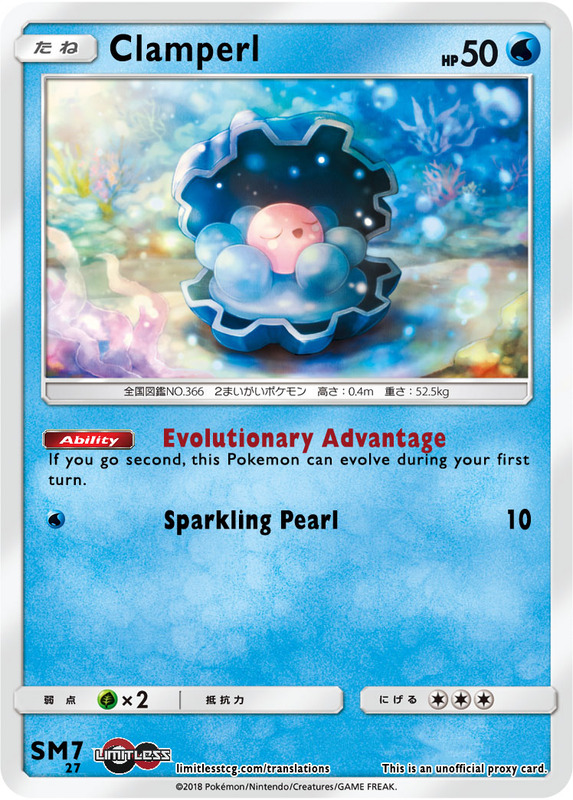 This Clamperl now becomes the optimal starter for any Huntail deck as it allows you to evolve into Huntail on the first turn of the game if you go second. The most likely Huntail for this to be played with would be Huntail from Primal Clash. Its Powerful Storm attack does 20 damage time the amount of Energy on play. There have been attempts to make this a playable card in the past, in particular with Ho-Oh EX, and the tempo boost it gets from this Clamperl might be enough to push it into being playable in the Expanded format. Luvdisc has the potential to be a phenomenal starter Pokemon in upcoming formats. Almost all decks, especially decks of late, like to play with a big bench with lots of Pokemon on it, so during your opponent’s first turn, they’re going to look to get their bench filled up with Pokemon. Luvdisc allows you to match what they have, allowing you to get a good setup, all out of a single Energy attachment. One nice thing is that you don’t match bench sizes with them, you get to search out however many Pokemon they benched. So if they only have three Pokemon benched at the end of your first turn, you can still search out three Pokemon to bench, but that can be in addition to 1 or 2 that you found through other means during your first turn of the game. Setup Pokemon have been out of style for awhile, but if they do make a comeback, Luvdisc has some decent potential. Regice is an odd card that doesn’t seem to have much of a purpose. 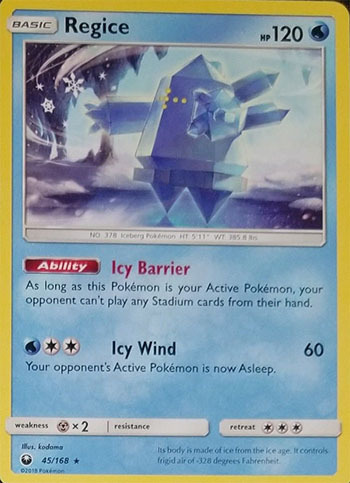 Blocking your opponent from playing Stadium Cards is definitely a nice Ability to have, but Regice doesn’t have an attack good enough to warrant it being in the active position and there aren’t any good hit and run attackers in format anyhow. I also don’t feel that Stadium Cards are played in a way where blocking them from being played is that big of a deal. 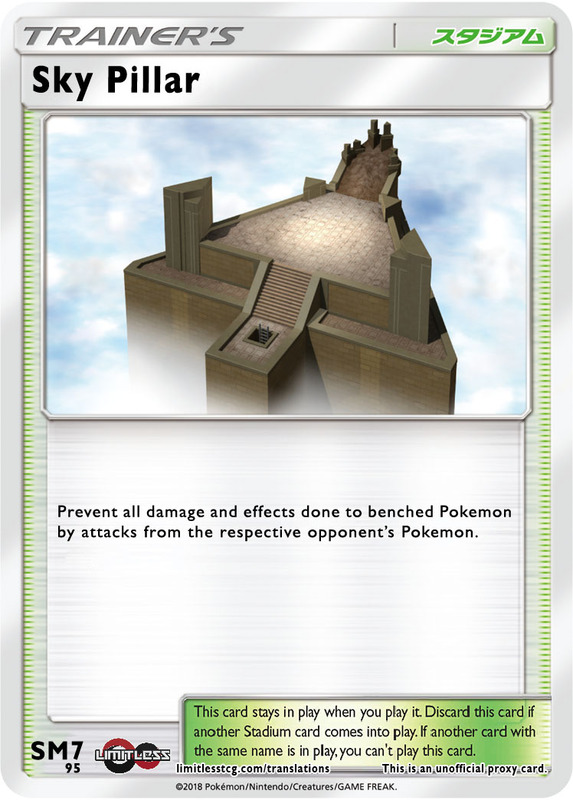 The one place I think Regice could be useful is in Expanded decks as an early game wall against Tropical Beach. If your opponent is playing a Tropical Beach deck, you can get Regice active, and then they may never get setup, as a result of not being able to play their Tropical Beach. Even then, I don’t see this scenario likely to play out. You wouldn’t realistically devote more than one deck space to Regice, and then you would have to either start it, or search it out/draw into it and get it into the active position. Since it takes that much effort for it to even work in that role, I can’t see players ever playing it in such a role. 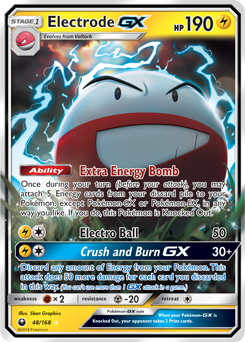 If there is ever an attacking Electrode deck, this card becomes somewhat better, but even in an Electrode GX deck, I think this Voltorb will help out. 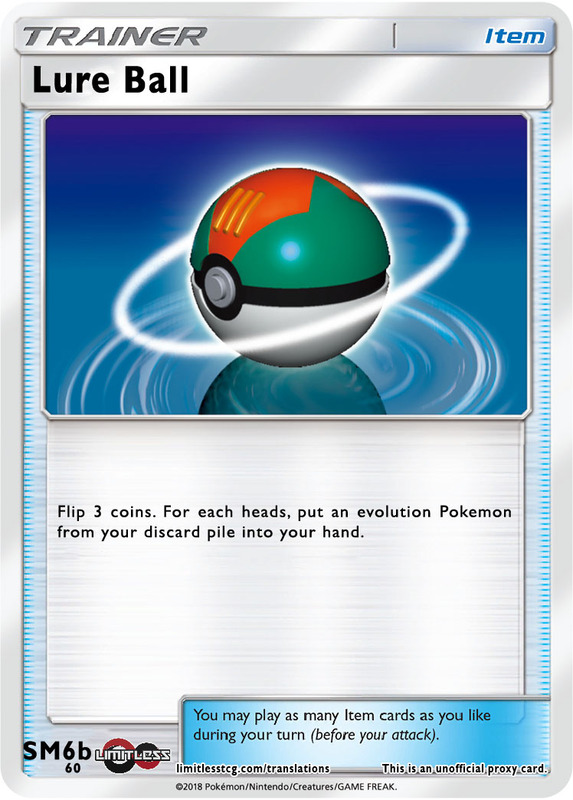 You won’t always want to blow up your Electrode GX right away, so being able to retreat your Voltorb to something else is still useful for the deck to have available to itself. 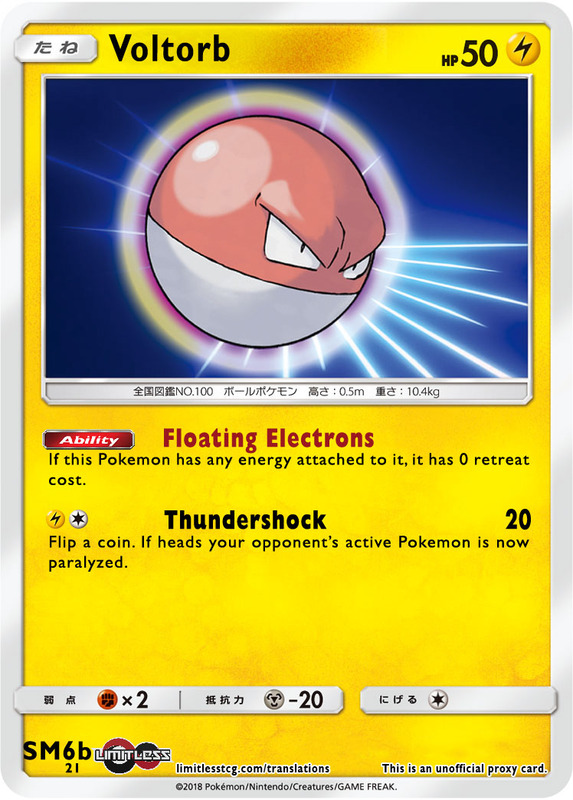 Then when you do blow up the Electrode GX, you discard the Electrode GX and all cards attached to it before attaching Energy, so that Energy attached to Voltorb could be one of the Energy you accelerate. Electrode GX will be used primarily as an Energy accelerator for non-EX/non-GX Pokemon with its Extra Energy Bomb Ability. These types of Abilities typically see play with Basic Pokemon, as it’s difficult to get all of this going. 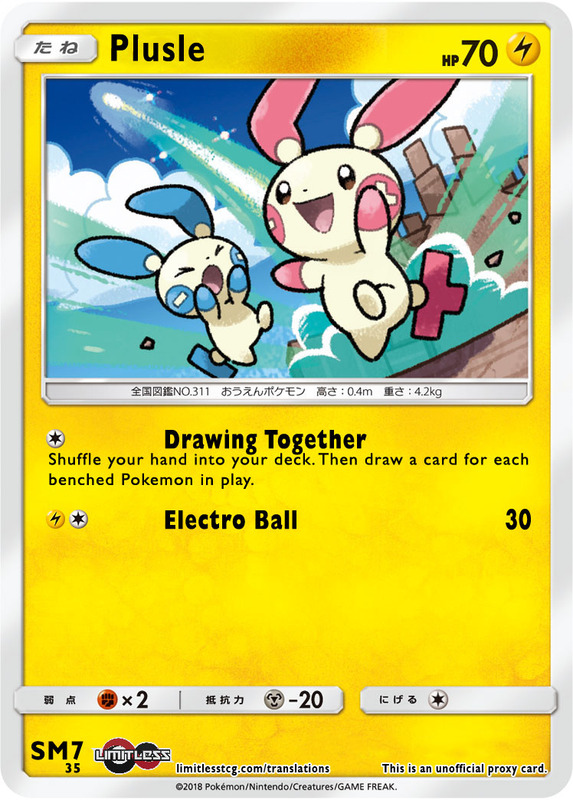 For new players, not familiar with this type of Ability, yes, you give up two prize cards when you knock Electrode GX out, but that can sometimes be worth it to power up a powerful, but Energy intensive strategy that wasn’t possible without some form of acceleration. Additionally, when you blow up your own Pokemon for prizes early in a game, you can take advantage of prize based come back cards to set your opponent back. 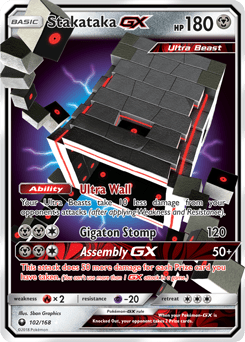 Electrode GX decks will be able to take advantage of the full suite of comeback cards, such as N, Counter Catcher, and Counter Energy after they blow up an Electrode GX. This type of card isn’t the easiest thing to build a deck around, as you need to find a Pokemon worth building a deck around that doesn’t have some other way to build a deck around it that doesn’t involve giving up two prizes, but they can still be built around and that’s the important point to stress to newer players who may not have seen a card like this before. Electrode being able to accelerate Special Energy cards gives it greater versatility, and I think makes it more likely to be played. The synergy with blowing up an Electrode GX, accelerating Counter Energy, while simultaneously activating that Counter Energy is one strategy definitely worth exploring. It’s always hard to figure out how these cards will be played without closely going every card in the format. Some of the more obvious combinations will be using Electrode GX to power up the attack damage for decks such as Xerneas BREAK or Turbo Darkrai, or powering up something like Celesteela from this set, which can OHKO as a Basic, but who needs a ton of Energy to do so. 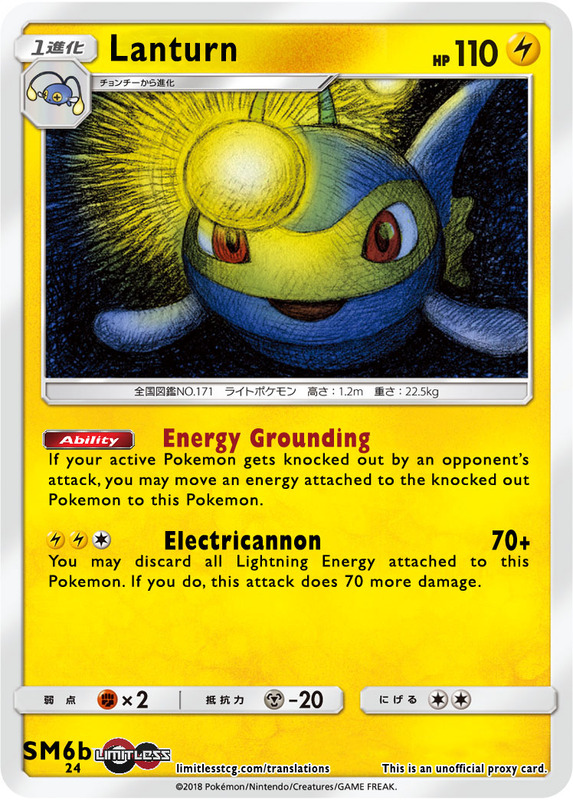 Lanturn can power itself up as the game goes along with its Energy Grounding Ability, which is essentially Exp. Share in Ability form. After two knockouts, you will be able to attach an Energy from hand to power up Lanturn. Lanturn’s Lightning Strike attack is solid, being able to hit for 140 damage if you discard all Lightning Energy attached to it. This means you can do 170 damage with a Choice Band, which is relevant for OHKO’ing a Tapu Lele GX, something being played in every deck right now. There’s some obvious synergy with Rayquaza GX, as it helps keep Energy (and thus damage) in play. A non-GX Pokemon that can power itself with its Ability, that also does enough damage that it can OHKO some EX/GX Pokemon is worth playing around with. Manetric has an Ability similar of that of Talonflame STS’s, that lets you start Manectric as your active Pokemon if it’s in your opening hand. Manectric is more limited than Talonflame, as it’s only relevant in decks playing Lightning Energy, while Talonflame could be played with anything because of its Colorless attack cost. If you do start Manectric, its Double Charge attack is solid, doing 40 damage, which can setup knockout math for you, while being able to accelerate two basic Energy cards from your hand. It should be noted that accelerating Energy from hand with an attack has generally been inconsistent. Searching it from deck or from the discard pile appears to give better proabilities for that Energy actually being there to accelerate. One nice thing about Manectric, in comparison to Talonflame, is that Manectric is a Stage 1, which means if you want to include a way to evolve into it for the times you don’t start it, the cost of evolving into it is much less, so you can get into the Manectric later on, only needing to include a copy of Electrike. In comparison, for Talonflame, you would need to play a copy of the Stage 1 in addition to the Basic, or at the very least a copy of Rare Candy. Plusle is a great setup Pokemon, drawing cards equal to the number of Benched Pokemon in play. If both you and your opponent have good turn 1’s, you can easily find yourself drawing in the 7-10 card range, which is very good. Cleffa HS only drew 6 cards, so Plusle easily has the potential to be better than that. Cleffa did sometimes deny knockouts with its Sweet Sleeping Face Poke-Body, so they’re not exactly comparable, but in terms of getting you draw to get setup, Plusle likely will net you more cards. At least off the bat, I don’t see Mr. Mime being a card with any impact. Both Choice Band and Fighting Fury Belt can be used to get any attack off a multiple of 20, meaning that any attack can be moved off this multiple with the aide of these damage modifiers. Beyond that, there isn’t much else to like about Mr. Mime GX. Breakdown would usually only yield low amounts of damage counters, which is nothing special when they all have to go on the active Pokemon. If your opponent knows that you’re going for Mr. 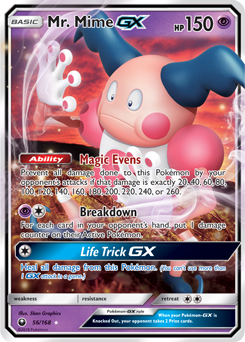 Mime GX as your sole attacking option, they can limit your attack damage by keeping their damage output low. Life Trick GX is also generally weak for a GX attack. To top it all off, Mr. Mime only has 150 HP, making it extremely easy to OHKO. It may have a little hope in a future rotation if it can find itself without any damage modifying Tools or other cards in format that can help get them off the multiple of 20s. Even then, presumably most decks can find away to attack with something that isn’t in a multiple of 20. 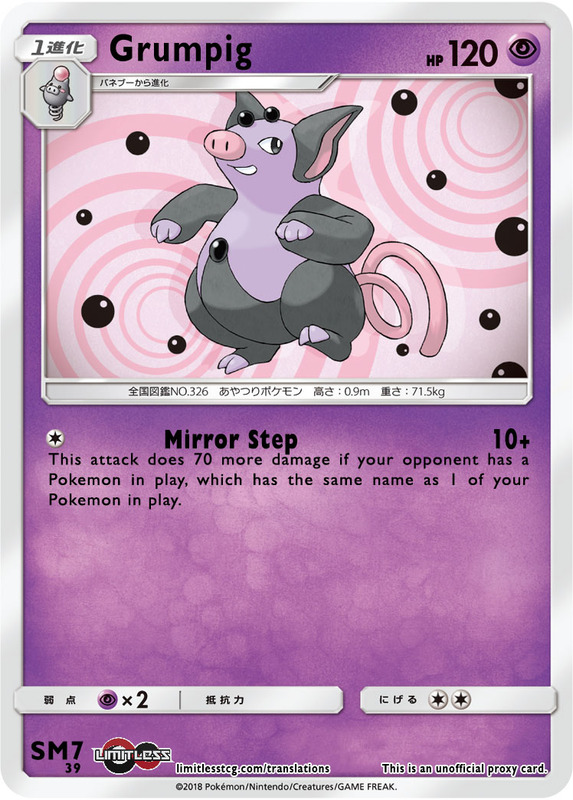 Grumpig has the potential to be a counter to Psychic weak Pokemon in future formats. With cards like Mew EX, Mew FCO, and Mewtwo EVO, Grumpig could be an option players turn to in the future, although the Deoxys from this set, which is similar to Mewtwo EVO, may be the go to option, although it’s not as pro-active as Grumpig is. Mirror Steps does 80 damage when boosted by its effect, which with a Choice Band becomes 110, which is of course 220 when accounting for weakness. In the Sun and Moon-on format, with no Parallel City, those Tapu Lele GX that players tend to play down throughout a game won’t easily be removed from the bench, which should make Grumpig a live card in most games. With that said, it’s still a three card combo (Spoink, Grumpig, and Choice Band) to counter the Psychic weak GX Pokemon that requires both players having a Tapu Lele GX (or some other shared Pokemon) in play, so players may not find it worth playing, especially since needing the Choice Band for OHKO’s will hurt it’s consistency as a counter. 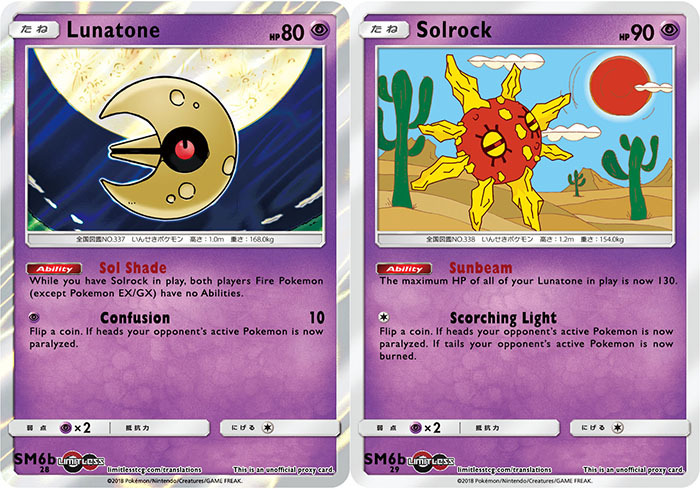 Lunatone and Solrock are another pair of cards that only makes sense to discuss together, as their Abilities work off of the other being in play. Lunatone’s Sol Shade Ability takes away the Abilities of non-EX/GX Fire Pokemon, while Solrock’s Sunbeam Ability boosts Lunatone’s maximum HP to 130. These cards seem like a troll job aimed at Blaziken that will be coming out in one of the next few sets. It has by far the most prominent Ability from a Fire non-GX in the Sun and Moon set block, and Blaziken’s Fire Stream attack does 90 damage, which Solrock’s Sunbeam Ability conveniently takes Lunatone’s HP out of OHKO range. I doubt these see play, but if Blaziken (or some other Fire Ability deck) becomes prominent enough, these certainly may see play, as these effectively shutdown a Blaziken deck entirely. We’ve seen this effect on attacks before, but this is the first time I remember seeing it on an Ability. I think this Banette will definitely be worthy of consideration in any Banette GX deck, but I can definitely also see it getting play on its own in the Sun and Moon-on format as a way to better manipulate the prize trade into your favor. The Red Eyes Ability is useful for bringing back both GX and non-GX Pokemon. If you have two prizes remaining and your opponent has only non-GX’s on the field, you would use Red Eyes to bring a GX back on the field that you could take your last two prizes on. You could even do it to bring a weaker GX onto the field. You may not be able to knockout a Gardevoir GX, because of its HP, but you may be able to do 170 damage to OHKO a Tapu Lele GX for game. It also cuts the other way, with you being able to bring back non-GX Pokemon to knockout at the end of the game when you get down to one prize card remaining. This is especially good against evolution decks, as pre-evolutions typically have 60-70 HP, which make them very easy to knockout. Banette GX walks into the format as the strongest Buzzwole GX counter in the game, being able to OHKO for a single Psychic Energy while also having resistance to Fighting, making it difficult for the Buzzwole deck to OHKO it. Additionally, the Shady Move can be used to move off some of the snipe damage Buzzwole GX does and put it back onto the opponent’s field. To maximize the damage output of Shadow Chant, you need to get your ten Supporter cards into the discard pile. By far the best way to do this will be to use Zoroark GX’s Trade. Once you have 10 Supporter cards in the discard pile you will be doing 130 damage. With Choice Band, that’s 160, and then you can use Professor Kukui to get to 180. With Shady Move, you can smooth over the remaining damage you need for knockouts too. However, it may be more fruitful for players to go the other direction and go for a 2HKO game with Banette GX. As it’s a Stage 1, you can use Bodybuilding Dumbbells to boost its HP up to 230, and since it attacks for only one Energy, it will work well with Max Potion. The Max Potion strategy also works well with its Tomb Hunter GX attack, which lets you get back 3 cards from your discard pile, which would let you play up to 7 Max Potion in a game. If the Sun and Moon-on format favors the 2HKO decks then Banette GX can find itself well positioned to do well. The one big downsize for Banette GX is that it is weak to Darkness, and with the prevalence of Zoroark GX in the meta now, and probably into the future with it being the best draw support after rotation, that could be a factor in limiting Banette GX’s play. As a result, I think we could see something like we saw with M Mewtwo EX two seasons ago, where it was unplayable because of one set of cards (Night March), and then it jumped into the meta as soon as those cards rotated. Deoxys acts as a replacement for Mewtwo EVO, which will rotate after the World Championship. Its Psychic attack is the exact same as Mewtwo’s, so players will be able to play Deoxys in the exact same way that they’ve played Mewtwo this season to counter Buzzwole and other Psychic weak attackers. For the Worlds format, I’m not exactly sure whether Deoxys or Mewtwo will be the better play. Deoxys comes with one less retreat cost, but 10 less HP. My gut would be to go with Mewtwo’s extra HP, as that can deny some knockouts, allowing you to use gain some extra turns out of using Mewtwo instead of Deoxys. As much as it would be nice to have a hit and run attacker do well in the format, I can’t see Donphan being that one. Three Energy is too costly for this type of attack, and we’ve had the 50 damage for three Energy Strafe attacks in the format, and they’ve never really saw play. Spinning Turn on Donphan PLS was successful largely because of its low Energy cost, as well as the OHKO potential of Wreck. Flail is a solid attack, but since you’re switching Donphan to the bench, how relevant would it ever be? As tantalizing as the boosted damage figure is from Medicham’s Enlightened Strike, I don’t think it’s very realistic to pull off. At 90 HP, Medicham is too easily OHKO’d, and there aren’t very easy ways to get 60 damage onto a Pokemon yourself. It also takes two Energy, so just getting it powered up, outside of Counter Energy, will be very difficult, and to use Counter Energy, you’re forced to play from behind. 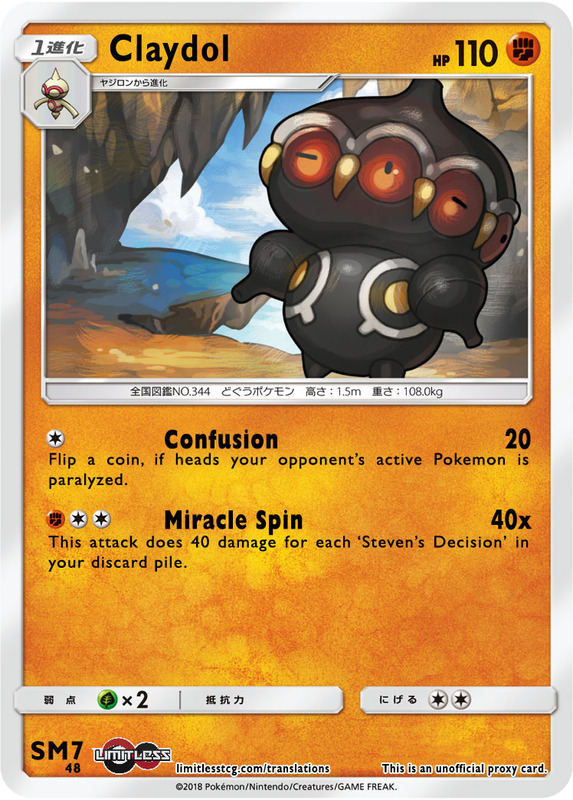 I think Claydol has some potential for its Miraculous Spin attack, which can do a maximum of 160 damage if you get four Steven’s Advice into your discard pile. That can be boosted to 210 damage with Choice Band and Diancie Prism Star. Even if you prize a copy, you can still hit for 170 damage, which is solid. In Standard, it’s probably too difficult to get the Steven’s Advice into the discard pile quick enough. In Expanded, it can be done quickly with Battle Compressor, but I think there are better OHKO options available in Expanded. Beyond the difficulty of four Steven’s Advice into the discard pile, you also need to figure out a way to stream three Energy onto Claydol, which is no easy feat. I think there are better non-GX gimmicks right now than the Miracle Spin gimmick. 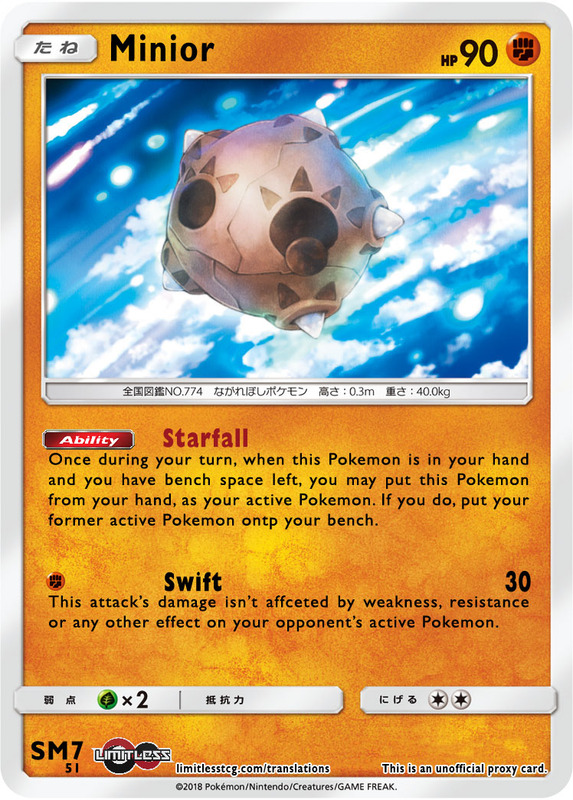 Regirock is a weird card to see released in this set, as it feels like a worse version of Baby Buzzwole. 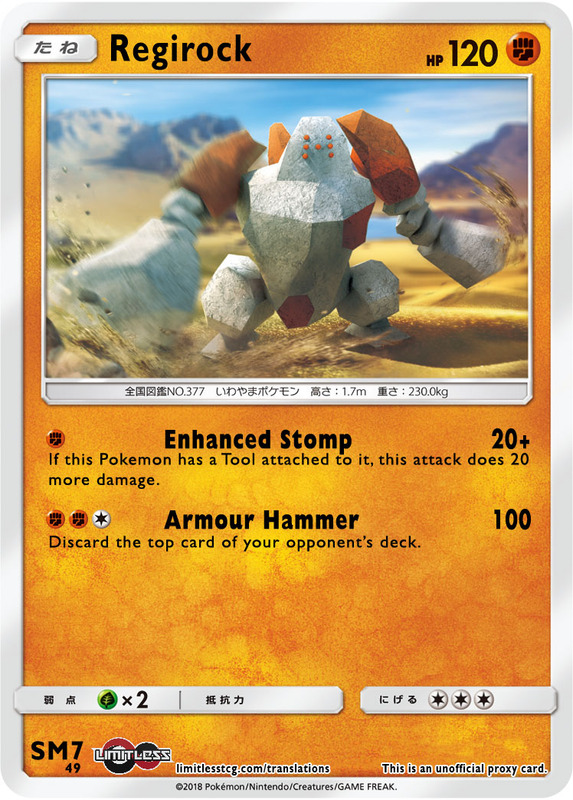 Enhanced Stomp with a Tool attached does more damage than Buzzwole’s Sledgehammer, but without the advantage of doing 120 when your opponent has four prize cards remaining. It’s Hammer Arm does 100 damage, which is equal to the average damage of Buzzwole’s Swing Around, but since Regirock isn’t an Ultra Beast it is much more difficult to power up as you won’t have Beast Ring available to power it up. Regirock would be okay in a world where Baby Buzzwole didn’t exist, but since it does exist, you’re better off just playing that. Palossand GX gives off heavy vibes of being a filler GX card. Its attacks are both costly and do poor damage output for the cost. 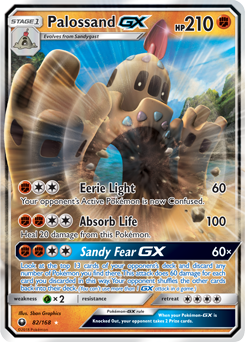 Its GX attack is interesting, with the potential to disrupt the opponent from getting setup by discarding their Pokemon, while likely taking a OHKO in the process, but with a massive [F][F][C][C] attack cost on Sand Fear GX, by the time you power it up, your opponent will likely be mostly setup, so the amount of disruption it actually does will be small. Minior gives decks a searchable switching option, although you can only switch into Minior with its Starfall Ability and not anything else. This can still be useful though. You can use Starfall in conjunction with Guzma when you want to attack with what you had in the active position already. It can also be used to reset attacks like Buzzwole GX’s Knuckle Impact or Lapras GX’s Blizzard Burn. With Zoroark GX in format, playing Lunala GX isn’t the safest thing to do for Pokemon based switching, so for some decks it may make sense to use Minior for a Switching Ability, even with it being inferior to Lunala’s Invasion. Alolan Rattata is nothing spectacular, but being able to search out its evolution for no cost will marginally help the consistency of any Alolan Rattata or Alolan Raticate GX deck. None of the other Alolan Rattata’s are spectacular, so this is as good of an option as any of them. 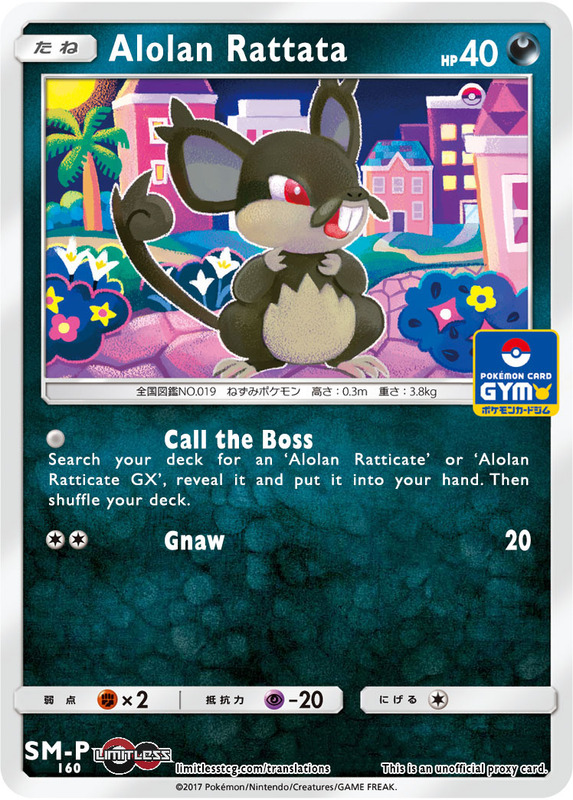 Alolan Raticate GX is flying under the radar, but I think the card may have a chance to be the centerpiece of something special, but at it’s lowest, it’s a top notch tech option. For zero Energy, Throw Away does 80 damage if you discard two cards from your hand. This can become 110 damage with Choice Band, which 2HKO’s a lot of the GX Pokemon in the format. 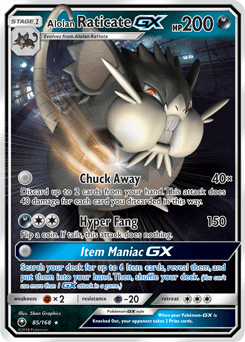 Since you don’t have to play Energy for Alolan Raticate GX, you will have plenty of room in your deck to tech against various other decks, or to include various types of support Pokemon to build a strategy around. The one concern I would have for Throw Away is having the two cards in hand to Throw Away, especially after late game N’s. Playing it with some form of draw support, such as Octillery BKT can help fix this issue. While its future as the centerpiece of a deck will have to wait to be determined, what won’t need to be determined is how strong it is as a tech card. Its Item Miner GX attack can be used as a setup attack, being able to search for six Item cards, which can be especially good in Stage 2 decks that can search out Items such as Rare Candy and Timer Ball to get setup. It’s not the best setup attack though, as you wouldn’t be able to get into it until turn 2, and since it is setting you up for the next turn, your opponent will have an opportunity to disrupt your hand. In the Expanded format, we’ve finally got a good counter to Trevenant BREAK. As long as you have two cards in hand, you can OHKO a Trevenant BREAK with Alolan Raticate GX for zero Energy. 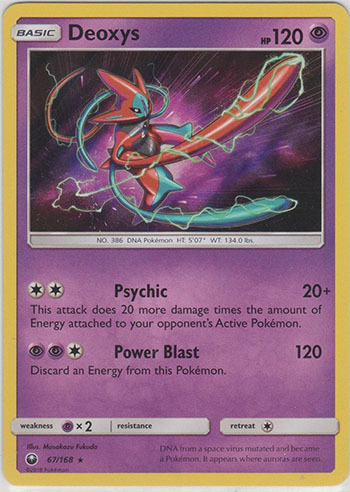 Beat Up Sneasel gets a reprint in Celestial Storm and it’s clear that Sneasel has been hitting the gym, because he now does 30x damage instead of 20x damage, which is a pretty significant increase. It can do up to 180 damage if you have a full field, but it’s dependent on coin flips, so your attack damage will be highly variable. As tantalizing as all that potential damage, this probably isn’t the play as far as Sneasel go. The other Sneasel in format have higher HP or so many amazing attacks, from Corner, to a sleep attack, energy removal, etc that it’s hard to vault up Beat Up Sneasel as the best option. 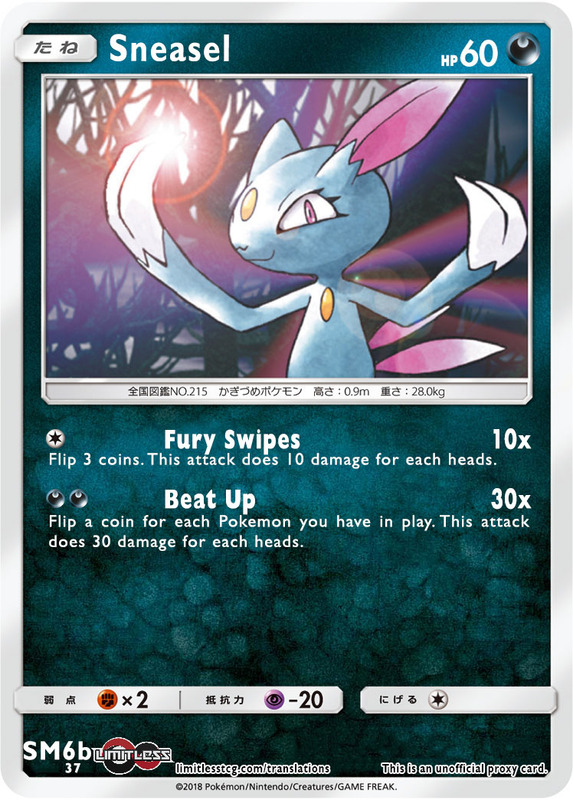 I do think Beat Up Sneasel could make sense in a deck that has the means to power it up over the other Sneasel though, so Counter Energy or Dark Patch Weavile decks. Its attack is very random, but still strong enough for knockouts and sometimes you may need to throw a Hail Mary to win a game, and flipping 5-6 heads on Beat Up could definitely be that Hail Mary. 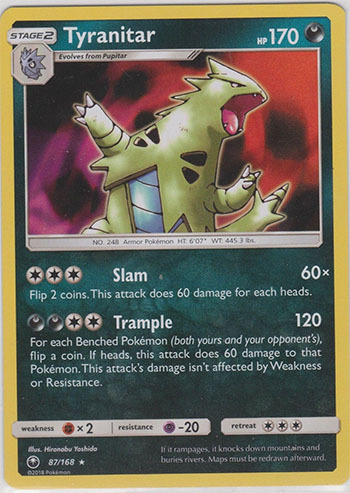 The sheer amount of damage that is possible with Tyranitar’s Trample attack is astounding, hitting benched Pokémon for 60 on a heads flip is a lot. Especially against pre-evolution Basics, a lot of which have 60 HP or less and would be knocked out from the snipe. You would be able to play a card like Mr. Mime to prevent damage to your own bench, or use it to power up an attacker like Medicham or any other low HP Pokémon that you could unlock Hustle Belt to be used with. As cool as these types of possible combos are, Tyranitar is still a Stage 2 Pokemon, it takes four Energy to attack, so it’s not realistic to build a deck around it. While Magcargo is rightfully getting the most publicity for consistency boosting in this set, Sableye is solid in its own right. 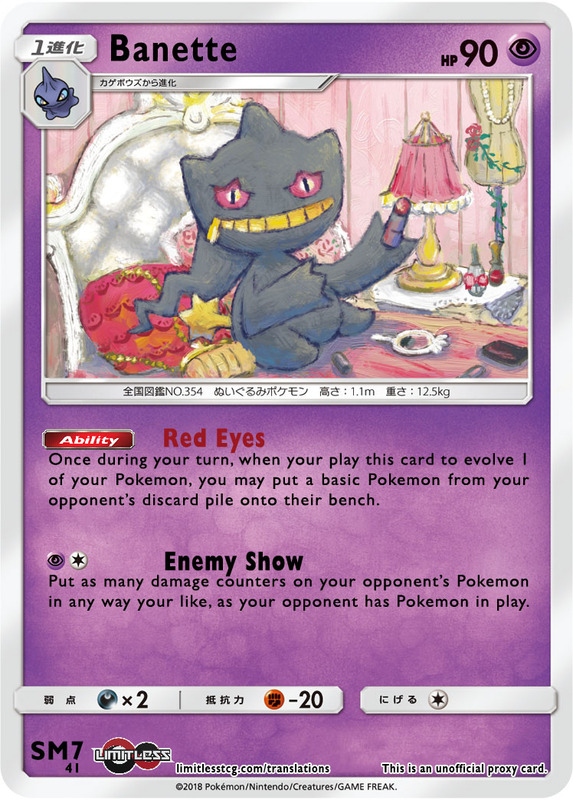 Sableye doesn’t give you the precision gameplay of Magcargo, but throughout the course of a game, if you’re intelligent with the cards you keep and pitch with Excavate, Sableye can help you win games more consistently as you get rid of resources you don’t need for a given game making sure you’re more likely to draw into them later in the game. 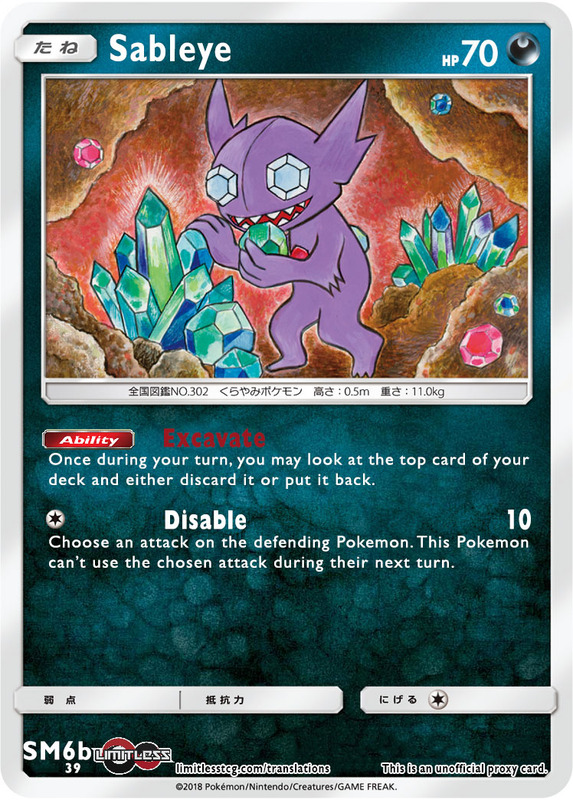 Sableye also provides some value to decks that look to get certain cards in the discard pile, such as Aqua Patch decks, Night March decks and more. If you use Excavate when you have no more cards to draw, but don’t discard the top card, you can play out the rest of your turn better as you will be playing with knowledge of your top deck on the next turn. Even if the card isn’t good that you’re excavating, you can play a mind game by keeping it, which could trick your opponent into playing a hand disruption Supporter to mess with your draw. Deck thinning has historically been a key component to late game consistency and Sableye plays to this key gameplay component. Sableye gains more value as the game goes on, so if games extend across more turns in future formats, Sableye will gain more value. Scizor GX has the potential to be an annoying deck to play against. Its Steel Wing attack is weak at first, doing only 80 damage, but that boosts up to 160 damage when Scizor GX has 100 HP or less. 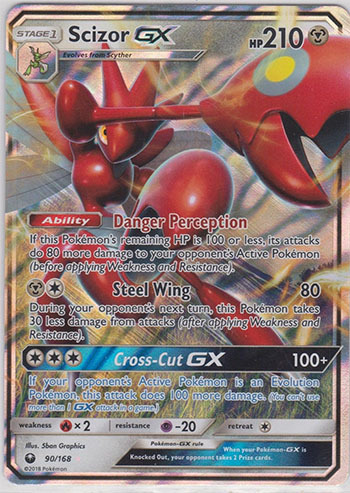 With Steel Wing reducing the attack damage of your opponent’s attacks by 30, it will be tough to get OHKO’s on Scizor GX, so situations where it’s Ability will trigger may not be too uncommon. Scizor’s Across Cut GX attack is good against evolution decks, but not very good against Basic Pokémon. It can grab a OHKO with Choice Band up to 230 HP. What my fear for Scizor GX is, is that most decks have such a wide array of viable attackers that it may be alarmingly easy to play around it’s Ability, leaving it as a weak, 80 damage per a turn Pokemon. It also will struggle against any deck that can OHKO consistently. Mawile looks to be a solid setup Pokemon, being able to grab you an Item. This could be especially useful for trying to pair together the Rare Candy + Pokemon combo in Stage 2 decks. It being able to directly attach Tool cards from deck is interesting. 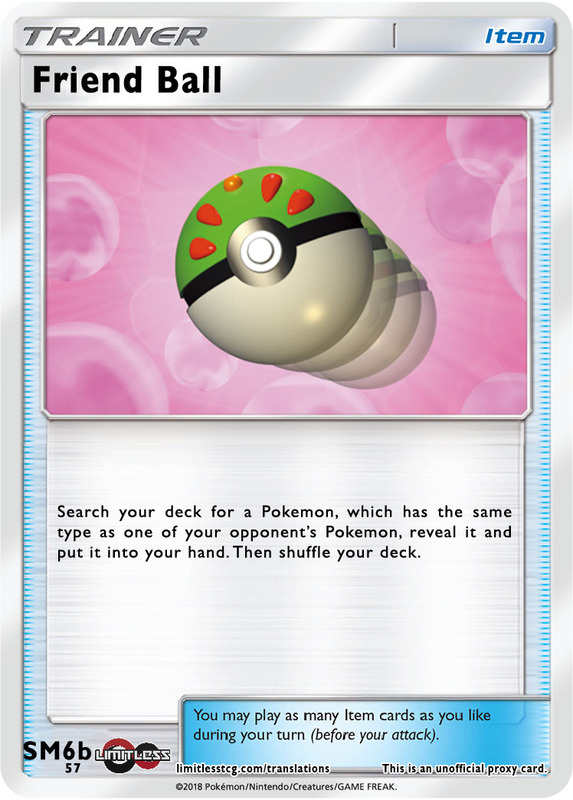 This could be used to make a Garbotoxin lock more consistent, to search out a Bursting Balloon for Mawile, and possibly other great combos from future cards. 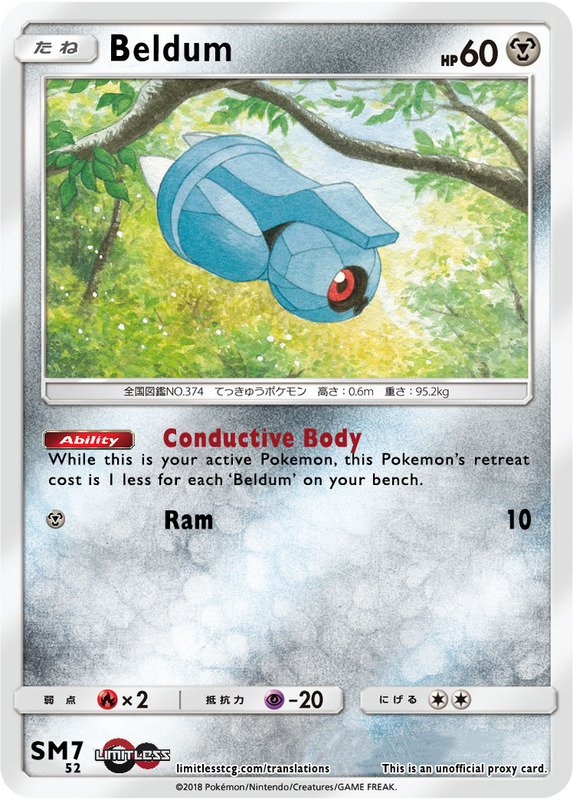 This should become the preferred Beldum that players play in their Metagross decks. The free retreat is very helpful in getting the deck setup, as you can use the Ability to retreat into setup Pokemon, such as Alolan Vulpix, even when you don’t have any Energy in hand. Being able to play Steven’s Advice without having your turn end is very strong. 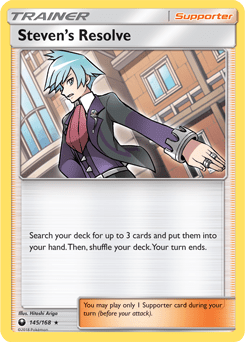 Being able to draw the exact 3 cards you want from your deck is very strong, and being able to use Steven’s Advice freely should help Metagross decks in their consistency in getting setup, as they can search out cards like Rare Candy when they need them to setup their field. I don’t think we will see Metagross played as a tech in other decks that aren’t Metagross decks as setting up a Stage 1 like Slugma for a similar effect is a path of much less resistance than setting up a Stage 2. As an attacker, Metagross is alright. It does a pretty good job being able to 2HKO most Pokemon if the effect on Meteor Mash isn’t reset by the opponent. Since it attacks for only a single Energy, you can use Max Potion to try to tank it some. It has 170 HP, which is traditionally strong, but at least for now, is extremely easy for decks like Buzzwole or Malamar to hit that damage amount and OHKO it. Registeel gives us a Basic Pokemon that can OHKO the two most prominent Metal weak Pokemon in the game in Glaceon GX and Gardevoir GX, as they both have Abilities. Beyond that, it has the potential to create good prize trades against Pokemon GX with Abilities that rely on 2HKO’s and can’t hit for more than 130 damage, such as Zoroark GX. I don’t see Registeel being used beyond Metal decks, however. Part of what made Bouffalant DRX so relevant was that it was a Colorless attacker that could be played with anything. 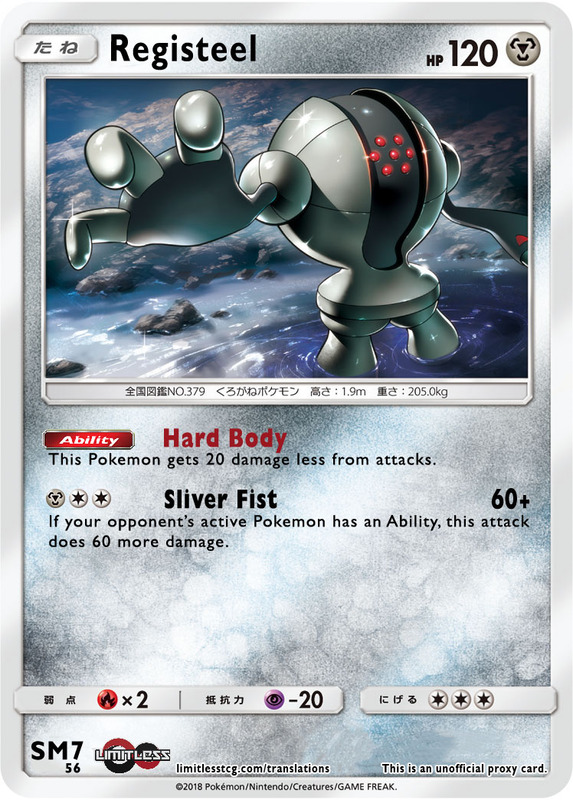 The Metal typing definitely makes playing Registeel mostly restricted to Metal decks. While taking free prizes is good, there isn’t a consistent way to get Jirachi Prism Star into your prize cards. Rotom Dex gives you a possible way to get it into your prizes, but that’s in no way a reliable way to do it. You do naturally prize it approximately 1 in 10 games, so the question is, how valuable is getting a free prize card 1 in 10 games? 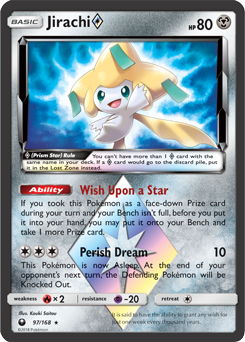 I don’t think the math is on Jirachi Prism Star’s side, and that there will typically be other inclusions for that slot that can get you more expected prize cards gained throughout a tournament. As far as its attack, it’s not very good. Between waking up from sleep and the prevalence of Guzma in the meta, it’s far too difficult to get this type of attack to work. Celesteela will be a great addition to anything that can play Metal Energy to attack with it. Being able to have access to what is potentially a OHKO attack for a single Energy attachment is super strong, even if it is only accessible in a specific situation. Six prizes remaining is a fairly common occurrence in Pokemon games. It won’t happen every game, as you can go from 7 prize cards remaining to 5 cards remaining, but with going from 8 prizes to 6, and 7 prizes to 6, there are more ways to get to six prize cards remaining than ways to skip over it. If you do play Celesteela, you will want to play it in a deck with Choice Band. With Choice Band it hits for 190 damage, which will knockout most Basic GX Pokemon. Playing it with no Tools or with Fighting Fury Belt takes away its power, as most of the Basic GX Pokemon that you can OHKO with Celesteela will have 180 or 190 HP. With Beast Energy, you can even boost the damage output further, to up to 220 damage. Finding Beast Energy has been somewhat inconsistent so far, but with the release of Lisia, we do have a way to search it out with a Supporter now, and decks playing Magcargo also can search it out via Smooth Over. The one awkward part about wanting Choice Band with Celesteela is dealing with it after it has attacked. You have to be careful and make sure you have a way to switch it out of the active, otherwise you may open yourself up to decking out if your opponent just leaves it there. With a retreat cost of four, once it attacks with a Choice Band, it’s very difficult to remove from the active position. 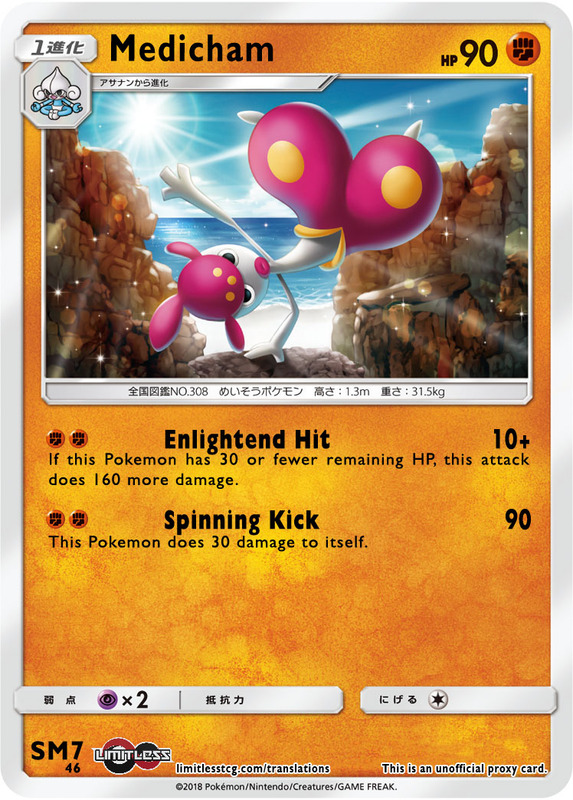 Outside of using it for its 1 Energy attack, it should be a very strong non-GX attacker in Magnezone UPR decks. Five Energy is very costly, but with Mt. Coronet, it shouldn’t be too hard to power up. It is an Ultra Beast, so you can play it alongside Dusk Mane Necrozma GX and power it up with Beast Ring, but I would think the Dusk Mane Necrozma would be the better Energy investment most of the time. Kartana can hit for a lot of damage in the early game, as you can hit for 130 damage when your opponent has six prize cards remaining. This can be boosted into OHKO range if one of the Energy is a Beast Energy. While the early game damage output is certainly appealing, I don’t think it’s very realistic to get this out and use it effectively. At 60 HP, it’s very easy to knockout, and since it takes two Energy to attack, you will have to power it up across two turns (except for Max Elixir decks in the World Championship format), and that gives your opponent an opportunity to knock it out before it attacks. Additionally, as soon as your opponent takes a prize card it’s useless. 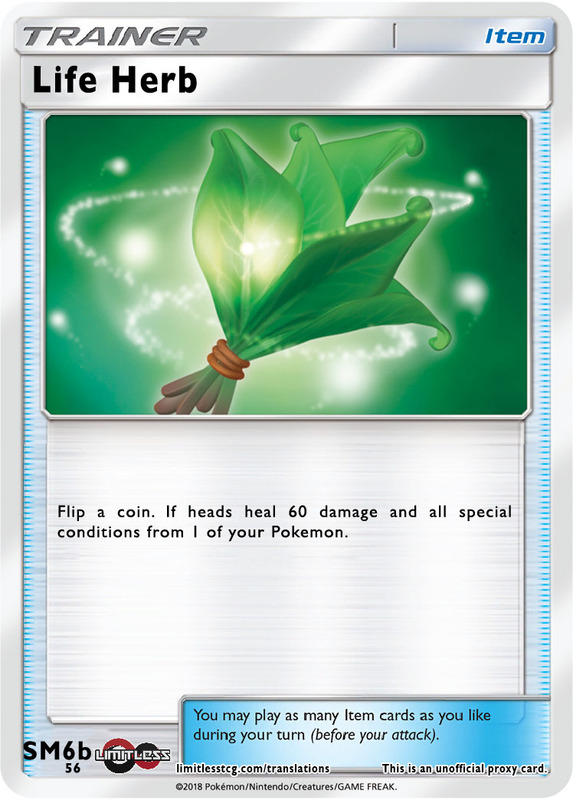 The same could be said about a card like Celesteela, except that Celesteela only takes one Energy to attack when its conditions are met, and it hits for more damage, allowing it to more easily take OHKO’s. We have seen these stackable Abilities in the past be used to add damage (such as Deoxys EX), but this is the first time I can remember seeing it reduce damage, and reducing damage should have more of an impact than boosting attack damage, as the damage reduction happens to all Pokemon, including benched ones, while the damage increase only went against the active position. In this frame, I think Stakataka GX is an excellent card, as it will be able to form some type of Ultra Beast deck that is able to take hits without being OHKO’d and also create an Ultra Beast that is effectively protected against any spread strategies as well. As far as attacks go, its Gigaton Stamp attack is functional for decks that can power it up, but nothing special, but its GX attack is very good and can OHKO most Pokemon with a Choice Band after you have taken four prizes, making it an excellent attack damage wise for closing out a game.I think Stakataka mostly slots into a bench sitter role for its Ability, but it is nice that in Metal Energy decks it can jump in as a useful attacker. It will be interesting to see what Ultra Beast it ultimately becomes successful with. I think the first card that it will be tried with is Dusk Mane Necrozma GX, as they’re both Metal types and that will be the first Ultra Beast that comes to mind with it. I think Buzzwole GX & Baby Buzzwole also have the potential to be interesting partners, as they’re both already bulky, and with cards like Diancie Prism Star and Strong Energy, you could have both damage increase for your attacks and damage reduction of your opponent’s attacks in the same deck. Naganadel GX will also be another natural partner with its Beast Raid attack. There are no Fairy Pokemon in this set. 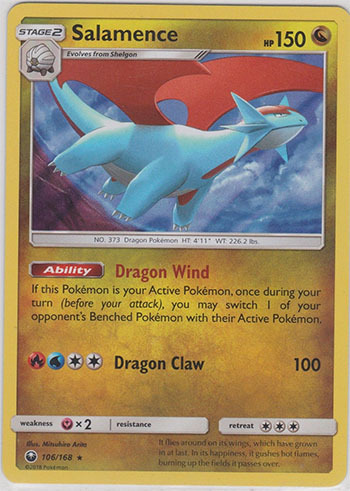 Salamence provides a guaranteed gust effect when it is active, but I think it’s entering the wrong format to be successful. With a three retreat cost, it will be difficult to switch it out, and with Float Stone rotating after Worlds, in the new Standard format you will actually have to find a switching effect to get it out of the active position since you won’t be able to promote it and retreat as you can now with Float Stone legal. As a Stage 2, with no easy way to retreat it when it’s active, I don’t foresee Salamence being played. Like most of these gust Abilities on a Stage 2, at some point, the investment of getting a Stage 2 out is so much that you’re just better off playing 4 copies of Pokemon Catcher. 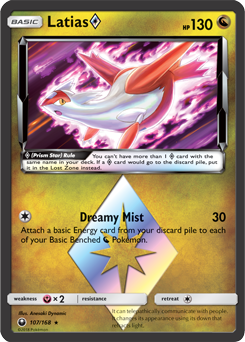 Latias Prism Star has what I think is the strongest Energy acceleration attack that I’ve ever seen printed on a Pokemon, and perhaps the strongest acceleration attack in the game’s history. With Latias, you are able to accelerate up to five basic Energy from your discard pile to your benched Dragon Pokemon. This is an insane amount of Energy to accelerate with a single attack. To make it even better, you also do 30 damage, so while you’re powering up something stronger to attack with, you’re also setting up damage for a 2HKO. With a Colorless attack cost, and being able to accelerate any type of basic Energy card, Latias Prism Star will be able to be played with any Dragon Pokemon, no matter what the Energy requirements of their attacks are. The most obvious pairing will be with Rayquaza GX, which is covered below. Rayquaza GX needs lots of Energy in play to do lots of damage and Latias Prism Star does a very good job of getting lots of Energy into play. Not to be out done, Latios Prism Star is a beast in its own right. Like Latias, it has a Colorless attack cost, allowing it to be played alongside any type of Dragon Pokemon. Latios Prism Star does 50 damage times the amount of evolved Dragon Pokemon you have in play, which means with 3 evolved Dragon Pokemon in play you can start hitting some OHKO numbers against GX’s with a Choice Band, and with 4 evolved Dragon Pokemon in play you can start hitting for 230 damage with a Choice Band, which will OHKO just about everything in the game. At 140 HP, Latios is also pretty bulky, so it may be able to get multiple of these 200+ damage attacks off before getting knocked out. Latios will probably be kept in check somewhat during the World Championship format by Parallel City and the limited benched space it would leave the Latios deck with, but post rotation, with Sudowoodo being the only way to limit bench space available, Latios will be largely left unchecked and should be a powerhouse in evolution Dragon decks. Rayquaza GX is the flagship Pokemon for Celestial Storm and it really is a special card. The main attraction of the card is its Dragon Break attack, which does 30 damage times the amount of basic Grass and Lightning Energy attached to your Pokemon. We’ve seen these types of attacks that scale based on the amount of Energy in play do well in the past, but Rayquaza GX looks to be stronger than previous Pokemon like this, such as Darkrai EX, as Rayquaza GX’s damage output scales by 30x, while the previous renditions only scaled by 20x. The cool thing about Rayquaza GX is that it will be able to be played in a variety of ways. You can play it in a turbo build in which you use its Stormy Winds Ability alongside Max Elixir to flood your field with Energy quickly and jump out of the gate fast, doing lots of damage. You can also play it alongside cards like Magnezone FLI or Vikavolt SUM that can accelerate Energy onto the field. The discards from Stormy Winds can be very harsh, and definitely can lose you the game if you discard too many of the resources that you will need to finish out said game. With that said, the benefit of getting the Energy accelerated usually outweighs the downside of the random discard. You can even use the Ability purposefully to help your late game consistency. For example, say you need Guzma to win the game, nothing else, and you already have all of your remaining Guzma in hand. One thing you can do is use a Stormy Winds Ability to discard cards from your deck, thinning your deck. If your opponent then N’s you, you will be more likely to draw into the card you want, the Guzma. The damage output is pretty stunning from Rayquaza GX. It hits for OHKO numbers on turn 2 pretty consistently, just off of using Max Elixir and Stormy Winds in the Turbo variant. You can further boost your damage output by accelerating Energy with Latias Prism Star. The damage output grows to OHKO’s pretty well when paired with Magnezone or Vikavolt as well. In the Turbo variant, Tempest GX isn’t an attack that you will typically want to use, especially since in builds like my own, you want to save your GX attack for Pheromosa GX’s Beauty GX attack. 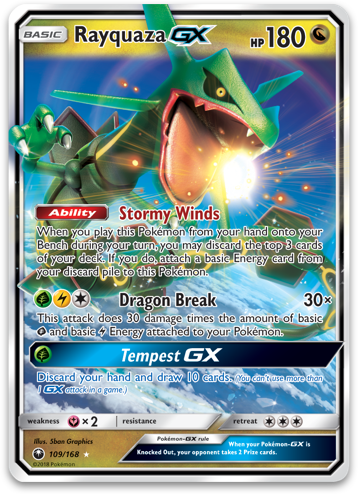 However, in the Stage 2 Rayquaza GX variants (Magnezone/Vikavolt), Tempest GX is an amazing attack that helps you get setup. If your opponent doesn’t disrupt your hand after you use it, you will start your next turn with 11 cards to work with, which greatly increases your probabilities of getting your desperately needed Stage 2’s in play. Even in the Turbo version it’s certainly nice to have a way to get yourself out of a dead hand. 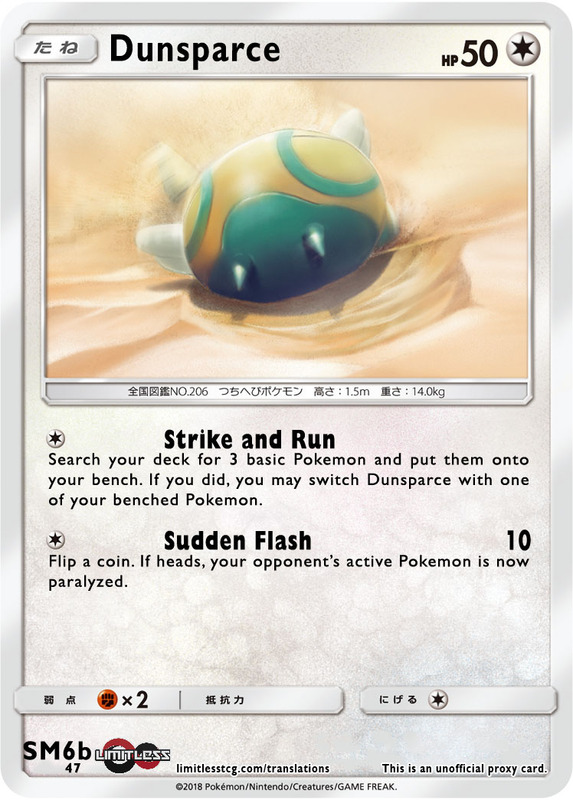 Dunsparce will be an incredible setup Pokemon for evolution decks. With a Colorless attack cost, it can be played in any deck that plays Energy cards, and as it gets three basic Pokemon for you, using Dunsparce’s Strike and Run is just as effective of a first turn as playing Brigette would be in terms of getting your bench setup. Being able to switch into one of those Pokemon is also a neat effect and could be used to promote a wall Pokemon of some kind, or just something that won’t get knocked out. I think Dunsparce will likely find its way into some evolution decks at the World Championship and will become an even greater staple after rotation. Sudden Flash adds a solid stall attack to any deck. If you successfully paralyze the Defending Pokemon, your opponent will need some type of switching effect, status removal effect, or an Escape Board to escape the paralysis. With Garbodor rotating, it is looking like Slaking is the king of Ability lock post rotation. When Slaking is active, the opponent’s Pokemon have no Abilities. The Ability lock is one sided, so you will be able to play your own Ability cards to support Slaking, such as using a card like Malamar to accelerate Energy so you can power Slaking up to attack in one turn. As an attacker, Slaking is pretty solid. It hits for 160 damage, so with a Choice Band you can hit for 190 damage, which will OHKO most basic GX pokemon. It can’t attack on consecutive turns as a drawback, but this can easily be gotten around with cards like Switch, Guzma, or Dawn Wings Necrozma GX. It is a Stage 2 Pokemon though, so it will be inconsistent. Sometimes it won’t get setup right away, giving your opponent enough turns of Ability to get setup enough to where they win the game. Sometimes you will get the Slaking setup, but then miss the Energy attachments and then be unable to attack with it. Stage 2 decks are less consistent than Basic and Stage 1 decks, so even though it has a strong Ability, that might now always matter if you whiff what you need because it requires too much setup. Even against Ability decks, it may not be good enough. Something like Turbo Rayquaza GX in the World Championship format uses its Abilities in the early game, so it would get setup enough to run over this deck. Even post rotation, Rayquaza GX decks will have Latias Prism Star to fallback on when they can’t use their Abilities. 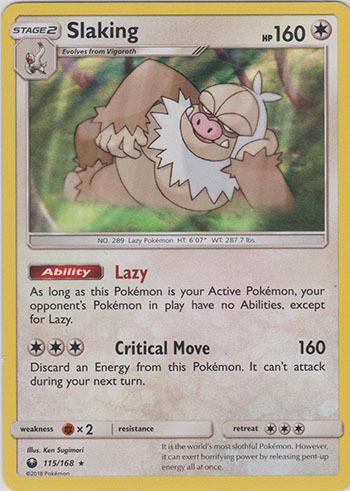 If the Slaking deck plays any bench sitters, players can use Guzma or Pokemon Catcher to bring something else active to re-activate their Abilities. Ability lock is usually strong, and Slaking has good damage output, so there is a lot of potential here, but as a Stage 2, there are still plenty of question marks as to whether it is truly viable. 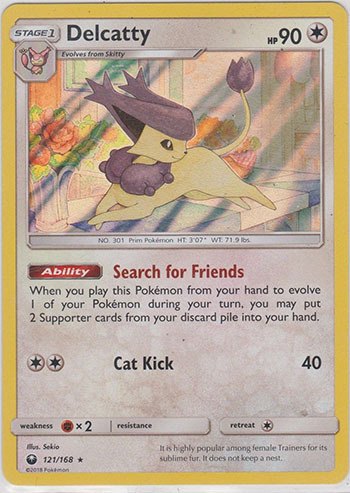 Delcatty’s friend search is able to retrieve two Supporter cards from the discard pile, giving decks more recovery options for their Supporter cards. What is great about Delcatty is that it puts it back into your hand, so you can use the Supporter cards immediately after recovering them. I don’t think Delcatty is likely to see much competitive play, although there may be some heavy disruption oriented decks that choose to play it. 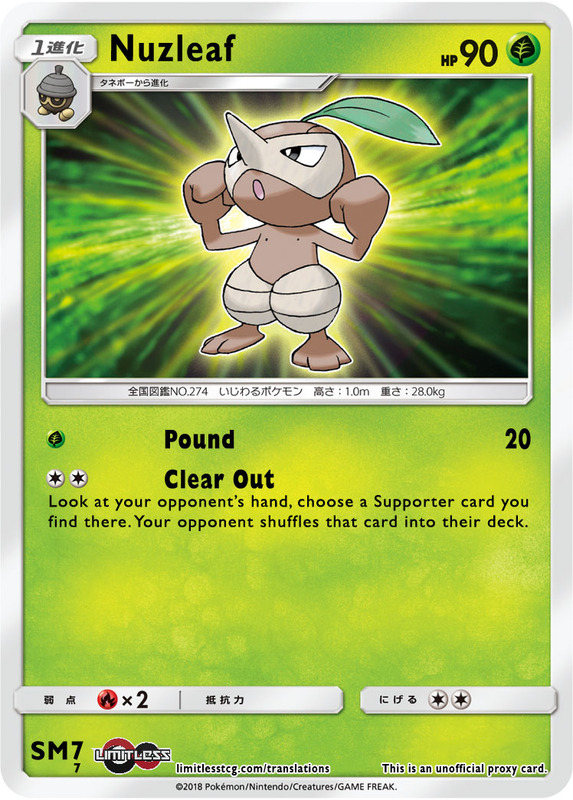 Most decks already don’t play any form of Supporter recovery, so it seems unlikely that they would play a Stage 1 Pokemon specifically for that purpose. If players do opt for Supporter recovery, I think they would opt for Pal Pad as it only takes up 1 space in a deck. It doesn’t get the Supporters back into your hand right away, but with Tapu Lele GX in format, it’s very easy to search a Supporter out of your deck. Being a Pokemon does add benefits for Delcatty, primarily that it can be searched out from your deck with your search Supporter and Ultra Balls. Kecleon can score OHKO’s against Lightning, Metal, and Psychic weak Pokemon. Being able to change types when it has a LPM Unit Energy attach allows it to become those types and OHKO Pokemon weak to it. At 80 damage, it can do 110 damage with a Choice Band, which becomes 220 after weakness. This will OHKO the Basic and Stage 1 Pokemon of the format, but will fall short against some Stage 2 Pokemon, such as Gardevoir GX with its 230 HP. It will be difficult to actually incorporate this into most decks, though. As it requires three Energy to attack. You will likely need to play it alongside either Multi Switch or an Energy Acceleration Ability to be successful with it. It also isn’t a very practical tech Pokemon, as you would have to commit multiple cards to the combo. 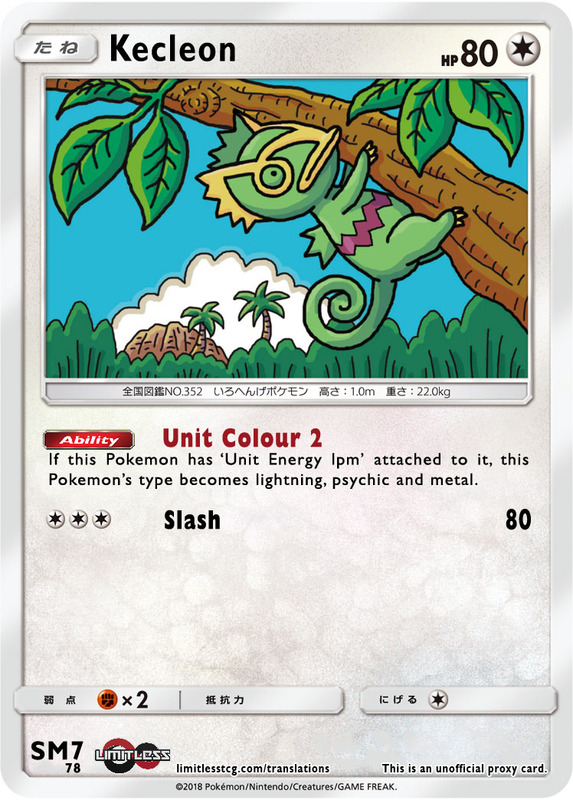 You would need at least two cards included between Kecleon and the Unit Energy, and if you’re only playing a solo copy of Unit Energy, how likely would you actually be to find it when it’s needed? If you’re playing multiple copies of the Unit Energy, you’re then devoting 3-5 card slots to a tech Pokemon. This could make sense in some very specific meta games, in which these types are super prevalent, but those types of meta games are rare, and in more diverse meta games, the Kecleon package in your deck may end up as dead cards too much of the time. Apricorn Maker is a functionally strong card, as cards like Nest Ball and Ultra Ball are strong cards, so searching them out is also a strong effect. However, there are other Supporter cards that can directly search out the Pokemon too, without needing to search them out via Ball cards. Pokemon Fan Club can grab you two Basic Pokemon to put in your hand and Olivia grabs you two Pokemon GX Pokemon and puts them in your hand. Brigette of course can be used until rotation, and puts 3 Basic Pokemon onto your bench. If the Pokemon you are looking to search out is from these two classes, it will generally be better to just play those cards, that way the search Items are still in deck to search for your setup later. In a lot of instances, I would rather play a draw Supporter to try to draw into these cards anyhow. Off of a card like Copycat or Cynthia you can draw into either the ball search cards you would get with Apricorn Maker, or just the Pokemon themselves, but you also can draw into other resources that you can use to further your strategy. Bill’s Maintenance is essentially a worse version of Hau, since you wouldn’t be able to play it when you have no cards in your hand. When you have cards in hand, you’re forced to shuffle cards into your deck, so you can’t even use this to grow your hand as well as you can a card like Hau. 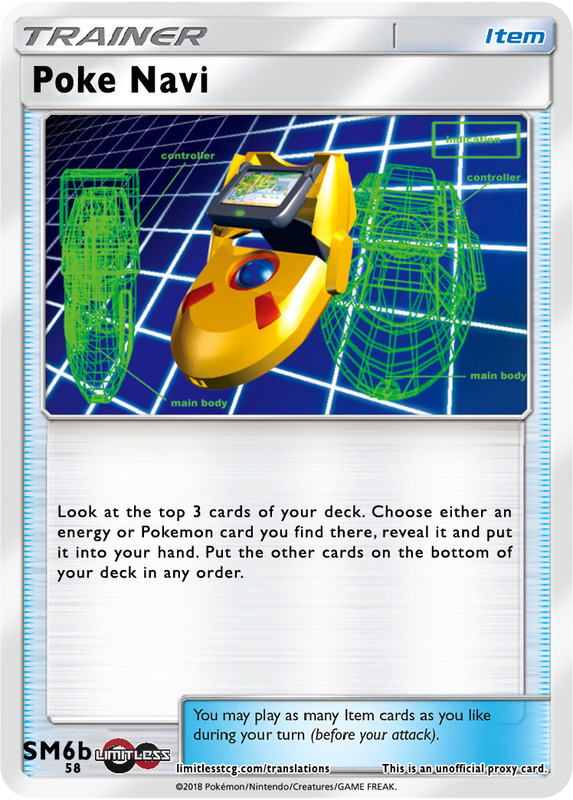 There are some situations where this would be useful, such as in a Vikavolt deck, putting an Energy back into your deck so that it could be Strong Charged, but for the most part these are all things that make the card worse. No one plays Hau as part of their Supporter engines, so a worse version of it doesn’t have any real chance of going in decks. They even reprinted Hau in this set so it could look over at Bill’s Maintenance with a disappointing look. The last time Copycat saw play, it was in a format with similar draw options. Professor Juniper had the same effect as Professor Sycamore, N was the same as N, and Professor Oak’s New Theory had the same effect as Cynthia. In this format, the majority of players chose not to play Copycat in their decks, but it should be noted that it was part of John Roberts’ National Championship winning Klinklang deck. The biggest problem Copycat presents is that it has a high amount of variance attached to it. If your opponent has a small hand size it’s not going to be very effective, and if your opponent knows you’re reliant on Copycat as part of your draw engine, they can play accordingly to negate its power. In Expanded, this is less of a concern since you can play one copy and VS Seeker for it a few times for when it’s good. I don’t foresee players dropping Colress to include it though. In Standard, I would be hesitant to play it in high counts, although a single copy in the deck could be good to take advantage of your opponent’s large hand size after they take prize cards or have been growing their hand for a few turns. It can be searched out with Tapu Lele GX, so you do have a way to search it out when you need it. 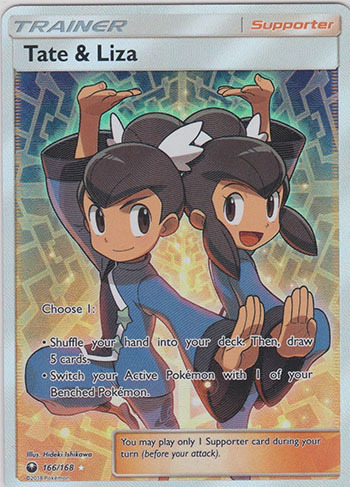 The post rotation format should also provide Copycat a better format to be played in than was the HGSS-on formats. With N rotating, there isn’t going to be as strong a form of hand disruption as there has been in the past. Judge will be around, but that’s much lighter disruption than N provides in the late stages of the game, so in previous formats with it, but no N, it hasn’t even been played in every deck like N is. With the most powerful draw Supporter in Professor Sycamore also rotating, it’s a pretty safe bet that players will turn to Zoroark GX for a draw engine post rotation, and if that’s the direction draw goes in the post rotation format than Copycat will have a format it can do well in this time around. 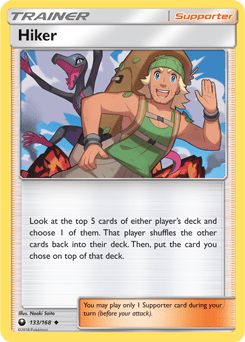 The way I think Hiker is intended to be used is as a disruption card that aims to counter the cards that players can search out and place on top of their deck with cards like Magcargo and Sableye from this set. As I highlighted in the Magcargo section, as good as drawing the cards immediately after using Smooth Over is, it is still a very good Ability to control your top deck for the start of your turn as well. In these situations, Hiker can be used to control the opponent’s top deck. I’m not sure this is actually a very healthy card to have in the game though, as it can also be used to promote punishing a player who is already behind. If a player is dead drawing, their opponent can use Hiker to ensure they keep dead drawing as long as they have one non-draw out in their top 5 cards. You don’t really want to be using Hiker on your own deck too often, the only situations I would see you using it on your own deck is when it’s all you have in hand and you’re digging for a draw out, or when you have too much good stuff in hand and want to sit on your hand and use it to give yourself a more optimal top deck for your next turn. 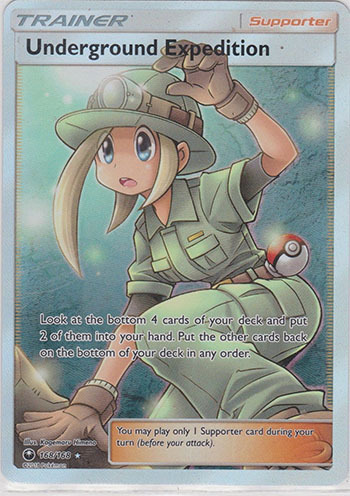 Lisia is a card that I don’t think will see a lot of play initially, but one I could see picking up in play if Pokemon decides to stick with the Prism Card concept. 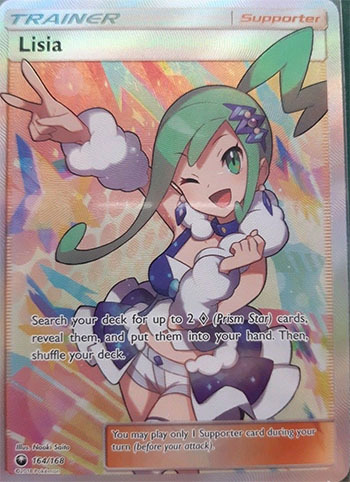 I do hope they stick out this mechanic for more than just a few sets, but as of right now, there just aren’t a lot of Prism Star cards you would want to search out with Lisia. The Pokemon can all be easily searched out with Ultra Ball, Nest Ball, Brigette, Pokemon Fan Club, etc. The Supporter cards can be searched out for Tapu Lele GX, and searching for a Supporter with a Supporter isn’t a great move anyhow since you generally can’t play two Supporters in a turn (even if some pro players think otherwise). Where Lisia could be used effectively is for searching out cards that traditionally can’t be searched out, and that is Special Energy and Stadium cards. Right now we have Beast Energy and Super Boost Energy, and there is also a Prism Star Stadium that will be released in a future set. Having a method for searching out these Special Energy will help make them feel less random. 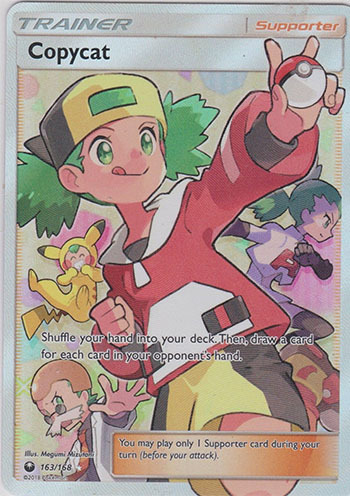 These cards could of course already be searched out with Mallow, but that only puts the cards on top of the deck, while this sends them to the hand. The Masked Royal has a lot of love as it gives Energy acceleration, but I don’t think it’s actually a good form of it. The acceleration comes from hand, so you not only need the Energy to accelerate with The Mask Royal in hand, but also a second Energy card, otherwise there is no point in playing The Masked Royal. It also only accelerates to Stage 2 Grass, Fire, and Water Pokemon, so you won’t even be able to accelerate to any of the pre-evolutions, really limiting the scope of the card. The biggest thing that gives me pause with this card is Blacksmith’s history in the game. Blacksmith is like 100 times better than Masked Royal, even if it didn’t see a ton of play. Blacksmith takes from the discard, which is easier to make sure Energy is there for use, and it also gets two Energy, and even with all that it wasn’t any kind of meta staple. This isn’t to say it didn’t have a big impact, from Pyroar/Charizard EX, to Vespiquen/Flareon, and later to Expanded Volcanion decks, it had a big time impact, but it was a few decks that were able to effectively use it. 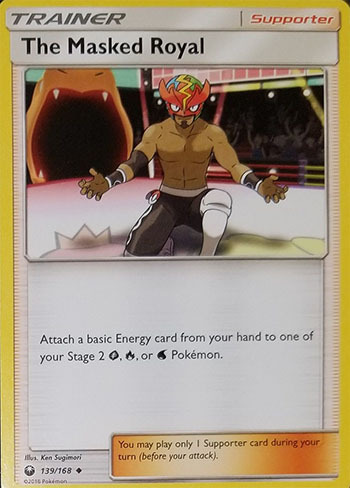 With The Masked Royal being an outright worse card, and so many other strong forms of Energy Acceleration, I don’t think The Masked Royal will be part of many, if any good decks. Steven’s Resolve has a strong effect, being able to search out three cards, but then your turn ends, so it’s not going to be a good card. The only time you would really want to use it is on the first turn of the game, otherwise you’re forfeiting your attack for turn, which traditionally isn’t a recipe for success. The only exception would be if someone created some deck that doesn’t attack, and instead uses Abilities or Items for some other strategy to win games, but these decks are very rare, and there is probably a better Supporter they can be using anyhow. Even if you use it on the first turn of the game, if your opponent plays a hand disruption Supporter, such as N or Judge, then you wasted your first turn Supporter. 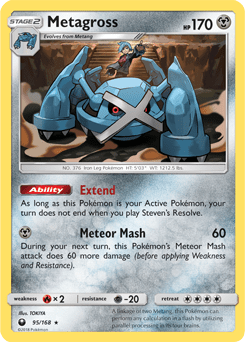 It is going to be okay in decks including the Metagross from this set, which has an Ability that says your turn doesn’t end with Stevens Advice, but it’s unlikely anyone uses that Metagross in anything except a Metagross deck. Even in the Metagross deck you still have the same setbacks with it as any other deck for the turns before you get Metagross into play. I’m a big fan of this card, it reminds me of Olympia, but better in my opinion. Olympia had the added benefit of healing 30 damage, but it was primarily being included into the decks it was in for the switching effect, which Tate and Liza also provides. I like this better than Olympia though, because I value the alternate effect of being able to draw 5 cards more than the secondary effect of healing 30 on Olympia. With Float Stone rotating in Standard, players will need to add more switching effects into decks to replace it, and Tate and Liza can help fill that role. I really like that it not only can help round out a deck’s draw support, but also give you more options for switching your Pokemon, as well as being a switching effect that can be searched out with Tapu Lele GX. 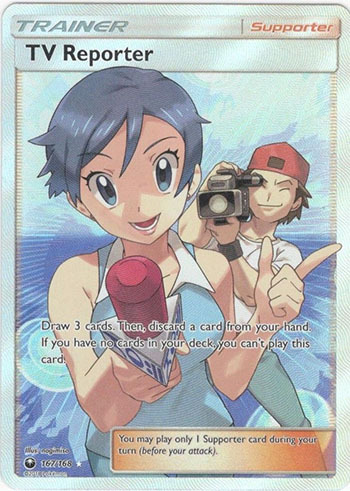 TV Reporter is another card in the Cheren, Tierno, Hau class of Supporters, so like Bill’s Maintenance and the reprinted Hau, it’s not something that you’re likely to see in deck’s anytime soon. The requirement to discard a card is variable in whether it’s helpful or harmful. When you’re struggling to keep cards in your hand, that discard could be brutal, but it also can combo with cards like Aqua Patch or be used to think resources not needed for the current matchup to help you not dead draw later. Most likely TV Reporter won’t see any significant play. Draw 3 hasn’t been a relevant effect from a Supporter the past few seasons, and if I’m going to go with a draw 3 Supporter, I’m likely just going to go with the vanilla option in Hau. Like a lot of other Supporter cards in this set, Underground Expedition is a generally weak effect, only netting you two cards, and only being searched out from a subset of four cards. When these cards you’re searching from are random, I would think that drawing 3 cards with a Hau would be superior. There are a few situations where a card like this could be useful. If you have an Ability, such as Gallade BKT’s Premonition and you know what you want isn’t on the top of your deck, you can choose to play from the bottom of your deck to try to find a more optimal set of cards. There is also cards, such as Oranguru from Ultra Prism that put cards on the bottom of your deck, so you can use a Supporter that gets cards from the bottom of your deck and put them into your hand. However, even if that’s what you’re going for, Underground Expedition is outclassed by Looker, which draws you three cards. Being able to dig 1 card deeper, at the cost of getting 1 less card doesn’t seem like a good trade off. Acro Bike returns to the game after taking a year off. Acro Bike has been a great card for turbo decks in the past, seeing success in a variety of decks, such as Archie’s Blastoise, Vespiquen/Vileplume, M Rayquaza, and Standard Vespiquen 2016-2017. The card allows you to draw through your deck quickly and it also gives you an Item based draw option, which means it is a card you can use to dig deeper if you whiff the card you want after playing your Supporter for turn or exhausting your draw Abilities. Acro Bike will will be especially potent entering this format, as it can be paired with Magcargo’s Smooth Over Ability for a great combo. After you use Smooth Over, Acro Bike functionally becomes a Computer Search, except that you discard a random card from your deck instead of two cards of your choice from your hand. 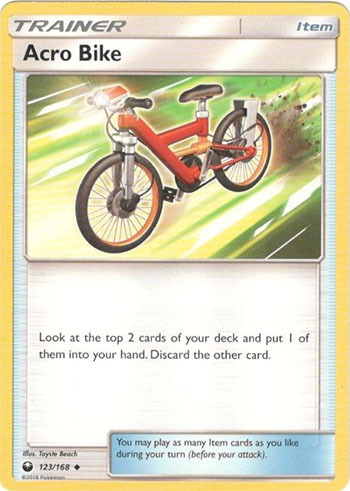 With Acro Bike in format, we will probably see more turbo decks pop up, something that was missing from the Standard meta this past season. I don’t really understand the point of Beast Ball. You only have around a 10% probability of prizing any individual card, so I don’t think those 10% of situations are worth worrying about, especially since you can play multiple copies of Pokemon anyhow. I feel like I’m missing something, and there must be some combo that I’m missing, but I don’t think that’s the case and this is just a bad card. Ultra Ball, Ultra Space, Nest Ball, etc. all seem like better options for searching out Ultra Beast. Energy Recycle System tries to strike a balance between Energy Recycler and Energy Retrieval, giving you the option to go from hand or back into deck. With Super Rod rotating out, in certain decks, I could definitely see this getting play. Many decks don’t have anything to do with the second Energy from an Energy Retrieval anyhow, so for these decks, if they want to recover Energy, Energy Recycle System would be superior to Energy Retrieval because of its versatility. 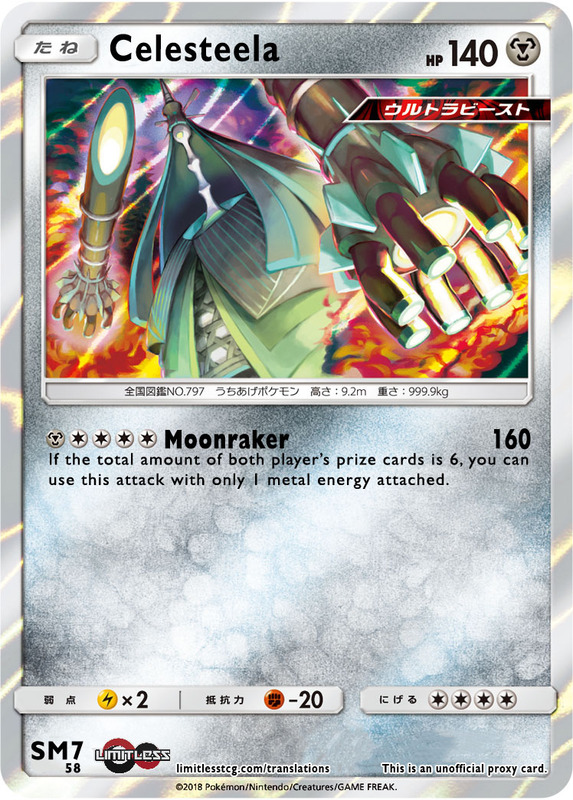 For the decks that do have something useful to do with that second Energy, they can keep playing Energy Retrieval, and for decks like VikaBulu which want to get a lot of Energy back in deck, they can keep on playing Energy Recycler. I am pretty sure that I own a World Championship deck that includes Friend Ball in it, and I feel bad for players that had to endure a format with this card as a serious consideration, as it feels bad, even back then. 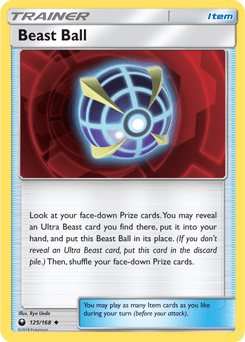 Having a card that is reliant on something your opponent has in play to be played is going to be inconsistent, and with so many better Pokemon search cards in format, Friend Ball should not be getting anywhere close to getting put in a deck. 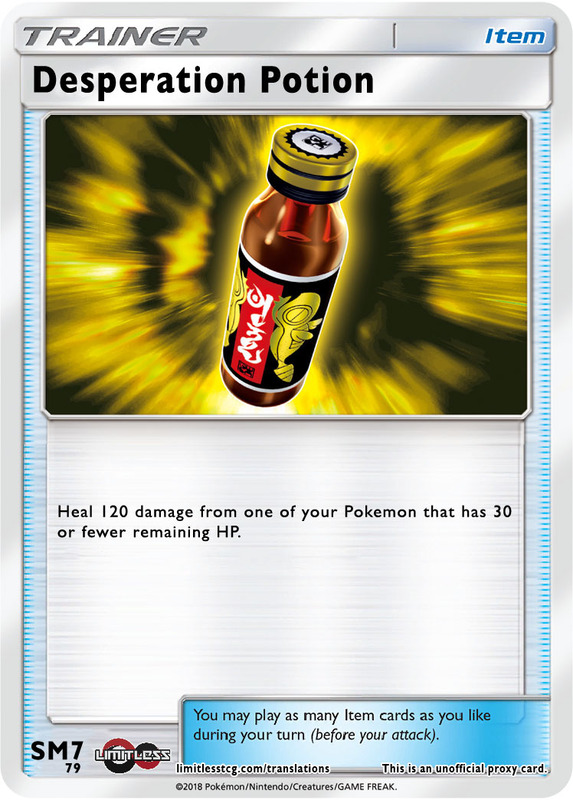 Last Chance Potion is very situational, but a card that heals 120 damage from a Pokemon that leaves their Energy in play should be difficult to use. There are a few obvious situations and combos that could work with Last Chance Potion. While it’s never a goal to leave a Pokemon short of a knockout, sometimes it happens. If you have a big attack powered up, play a draw Supporter, but whiff the Choice Band, you probably want to take your big swing. In a deck like Buzzwole GX, for example, you could put in your big hit with something like Sledgehammer, and then plan on taking the knockout with a Jet Punch later in the game. In this type of situation, Last Chance Potion may be playable. It can also be very useful against spread decks. For example, if Buzzwole GX snipes a benched Zorua for 30, you would be able to play Last Chance Potion to heal the Zorua to make sure it’s not knocked out. Against spread decks, whether Pokemon based or Shrine of Punishments based, they may rely on multiple spreads before a knockout, so you could use Last Chance Potion right before they’re getting to the point of a knockout. The last time Life Herb was legal it really didn’t see much play. The only place I can remember it seeing play in was these Quad decks that popped up in that format, Quad Groudon EX and Quad Entei EX, which played a ton of healing cards (such as Moo Moo Milk) to tank their Pokemon. Healing 60 damage and Special Condition is a strong effect, but probably not good enough to warrant deck space when the effect only triggers on a coin flip. If I had to guess, Lure Ball is being setup as the primary form of Pokemon recovery in an Ultra Prism-on Standard format. As of right now, I don’t really see a reason to play it in either format upon release. For search, cards like Timer Ball, Evosoda, Ultra Ball, etc. should be better at more points in the game, as with Lure Ball, you would have to wait until the Pokemon are in the discard pile before using it. It is possible though, that in Expanded a Battle Compressor into Lure Ball engine could be effective for setting up evolution decks. As for recovery, Rescue Stretcher seems like a safer option. Lure Ball would have a higher expected value (1.5 Pokemon versus 1.0 Pokemon), but Rescue Stretcher is guaranteed to work and has the added versatility of being able to get back Basic Pokemon, as well as shuffle Pokemon back into the deck. I can’t see PokeNav seeing any serious play. 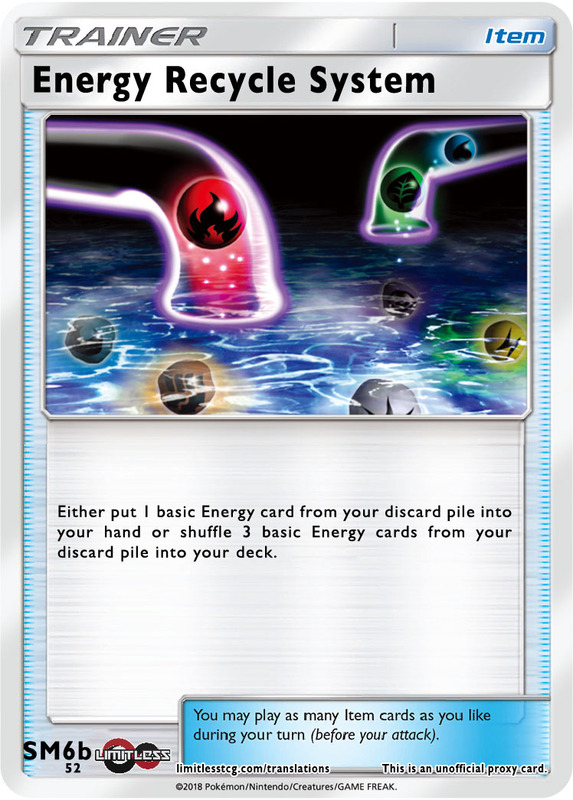 Cards like Energy Loto, Professors’ Letter, and Energy Search all can be used more effectively for finding Energy, while there exists a ton of Pokemon search cards that outclass it. Given that so many of these much better cards for finding Energy aren’t all that widely played, something worse probably won’t see play, even if it ends up in a rotation that doesn’t include any of these cards. We’ve had a similar effect legal the past few years in Pokemon form with Smeargle BKT’s Recoat Ability, which swapped from the discard pile instead of the deck. Smeargle never really caught on in competitive play, despite the Ability being very cool, so it is somewhat difficult to see it having better results in Item form. The one thing that made Smeargle difficult to play is that it was released alongside Parallel City, so in many of the past few years formats, players have had to deal with the reality that they probably have to play with only out of three bench spaces, so decks utilizing Smeargle strategies had a difficult time succeeding as a Parallel City could harm the setup and prevent them from doing what they needed to do. Once it stopped receiving consideration for decks initially, I would assume most players completely forgot about the card. I think being able to swap Energy types is still a strong theoretical effect, though. It lets you use Energy acceleration for a different type and then swap it to the type of Pokemon you need. It’s a little convoluted, but with the right combo I can definitely see it working. 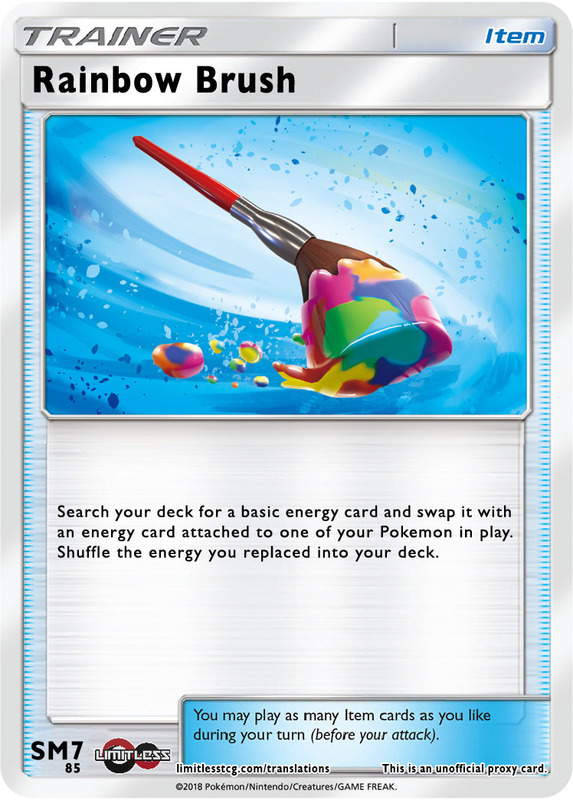 A secondary effect of Rainbow Brush, is that you can swap out a Special Energy for a Basic Energy, something that you can do to protect you against Enhanced Hammer in the late game or to allow you to hit into a Xurkitree GX. Hustle Belt is an extremely powerful card, being able to boost your attack’s damage output by 60 damage, which can really help you reach for those big OHKO’s. 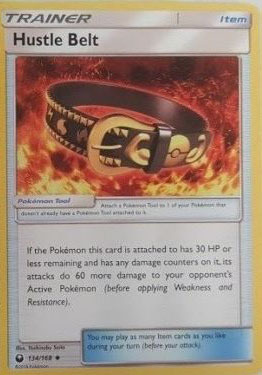 A strong effect of course comes with strong restrictions, and Hustle Belt is no exception, only being able to be used when you have 30 HP or less on your Pokemon. I see Hustle Belt being used in two primary fashions. It can be used in a deck with low HP Pokemon to boost their damage. Joltik immediately comes to mind with its 30 HP in Night March, but there are other Pokemon that can be pushed down to less than 30 HP remaining with some help. With Rainbow Energy, Po Town, and Frozen City, there exists some possibilities for self damaging enough to put your low HP non-EX/GX Pokemon into Hustle Belt range. I do think it also probably has a place in decks in general. I think it would most likely be played as a 1-of and pulled out of the deck when the situation arises for it to be useful. With Magcargo, players will have greater search access to their decks, and there is also the Adventuring Satchel card coming out in a future set that will help players search out Hustle Belt. 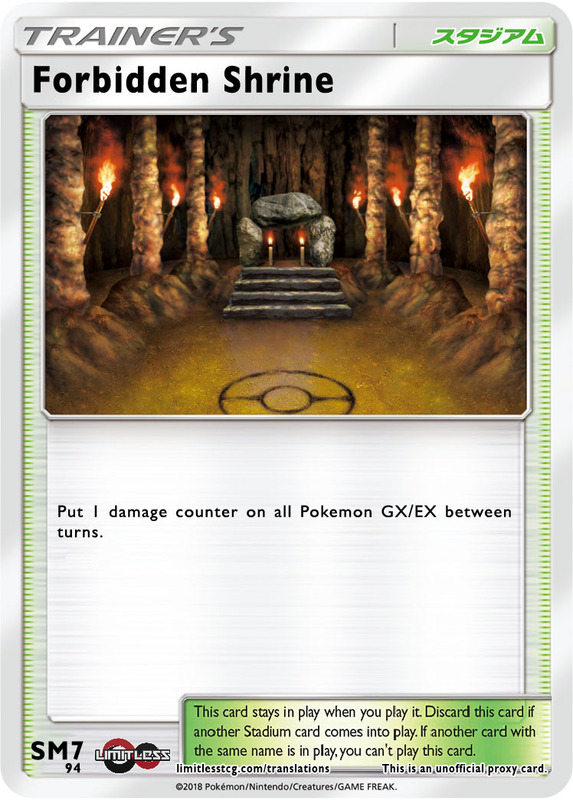 Shrine of Punishments is going to be a major game changer, being able to pummel EX/GX Pokemon with damage counters every turn that it is in play. This will be a major gain for any non-GX deck, allowing them to get extra damage reach against the GX Pokemon decks. 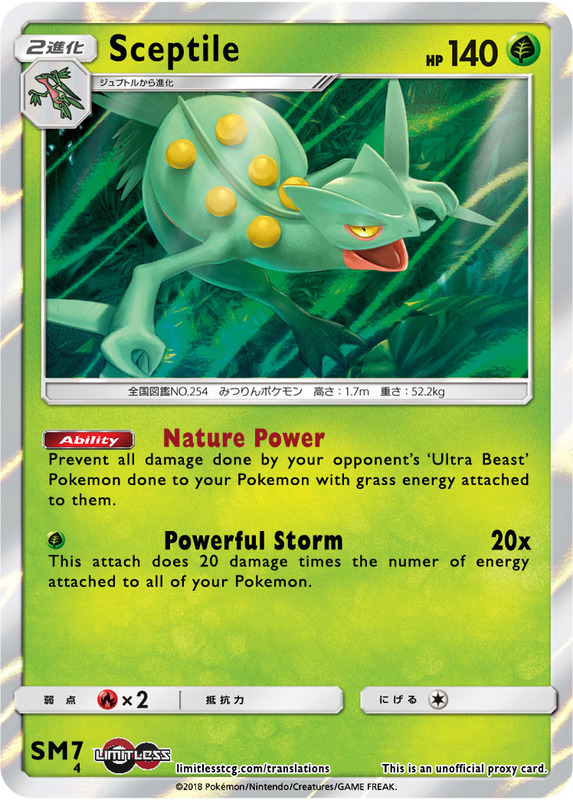 The damage numbers of most of the non-GX Pokemon weren’t matching up well with the GX Pokemon, so if you can add 4-5 damage counters from your Stadium throughout a game, possibly even more, that could be what these non-GX decks need to compete. I think it may also find some niche use in EX or GX oriented decks. Some EX or GX Pokemon may be falling just short of the damage output they need to be an effective card, and this will give them that last push. I think this will be a much more uncommon use though, because it will have a negative impact on the deck playing it, so you would have to find a Goldilocks situation where it helps you while not being too much of a detriment. Free damage output is very strong, so being able to get free damage from playing a Stadium card is super strong, especially since you will always get at least 10 damage out of it if your opponent has a GX or EX in play. A card like Po Town, your opponent gets an opportunity to remove it before it has any effect, while Shrine, if played at the right time, will always have an effect. Sky Pillar is a buffed up version of Mountain Ring, this time being able to prevent damage from effects in addition to actual attack damage. Being immune from damage from effects of attacks prevents damage from an attack like Espeon GX’s Divide GX. With Mr. Mime rotating, this also appears to be the best way to prevent benched damage in the Standard format post rotation. Relying on a Stadium Card for this type of effect generally hasn’t been a great strategy, however. Stadiums are too easily removed so you generally don’t get too much value out of a card like this. Spread and snipe decks also usually don’t make up too big of a portion of the meta, so you’re Stadium only ends up being useful against a small subset of matchups. There are no new Special Energy cards in this set, but there is a reprint of Rainbow Energy. Misread the translation. There is an update to Alolan Raticate’s review with the correct attack information, with adjustments accordingly for the weaker GX attack. About Alolan Raticate ‘Its Item Miner GX attack can be used in any deck to recover Items to further its strategy.’, I think it search items from deck rather than from discard pile. Crazy idea for the Jurachi Prism Star. Whenever you use its ability, use ninjaboy, use rotom dex, and then use beast ball or Gladian. If jurachi isn’t in the prize use rotom dex and beastball/gladion again. I know it sounds crazy, but you only need to pull it off a maximimum of three times. To get the prizes you can try a missing clover deck, because it normally runs out of steam at 3-4. You said that Hustle Belt would be a great addition for Joltik in Night March decks, but I don’t think it will be as great as you make out. 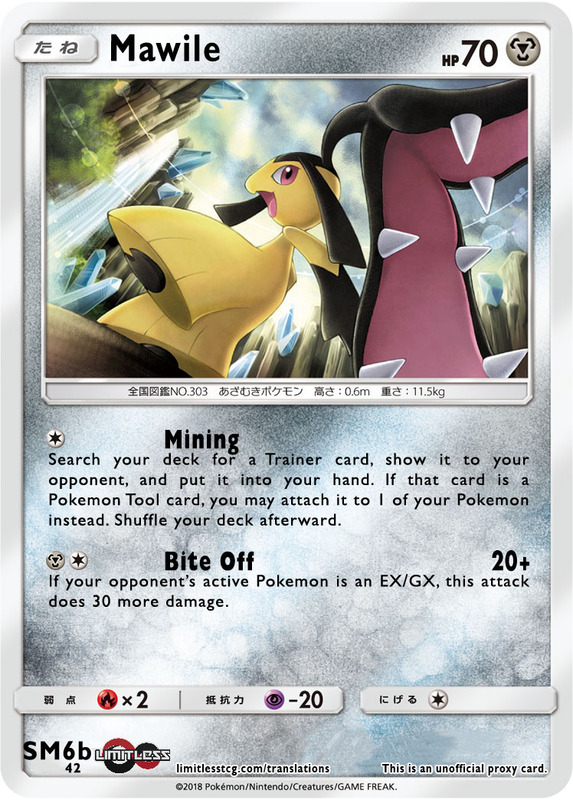 The card text also specifies that the Pokemon it’s attached to needs damage counters on it, and if Joltik takes any damage, more often than not it will be knocked out. Playing other cards that can move around damage counters can help with this, but that might require fitting in even more techs.